And then it happened. 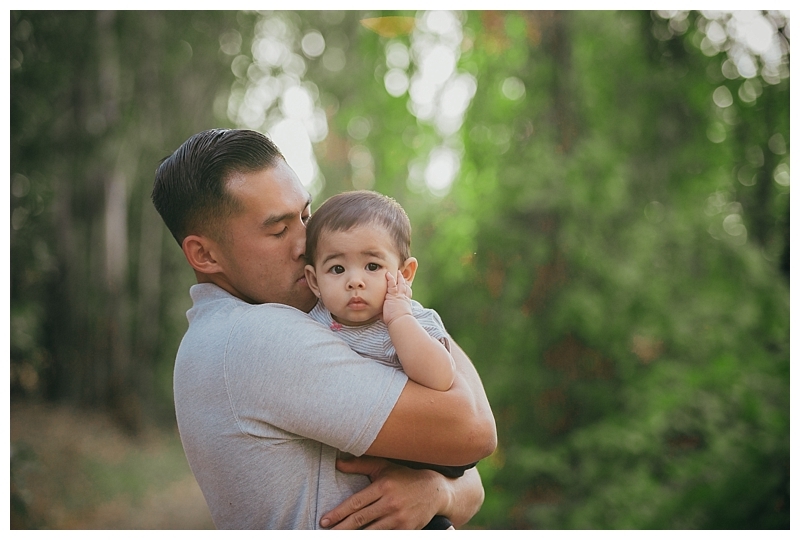 One moment our little guy had a healthy 168 beats per minute and the next, gone. I sat through October, knowing every minute of everyday that it was Pregnancy and Infant Loss Awareness month. I watched sports stars, friends, family members and complete strangers share their loss stories and I just sat crippled. Unable to speak about it. 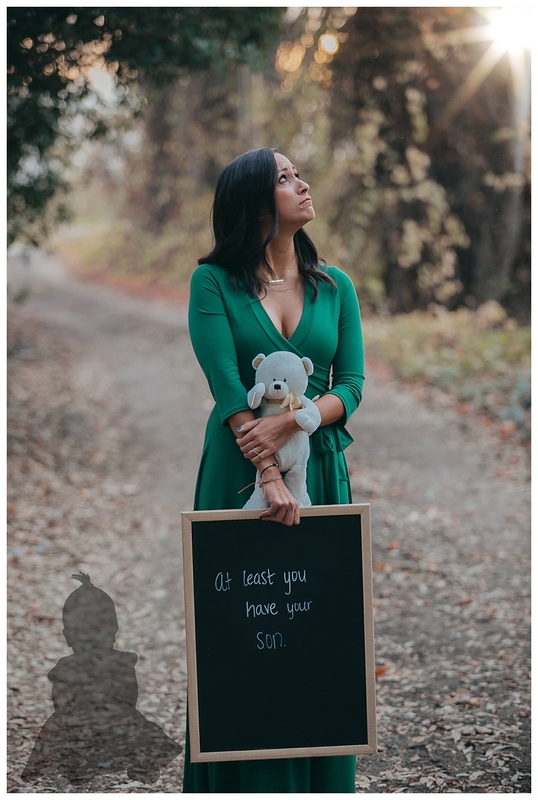 Blanketed by pain, loneliness and the debilitating sadness that because no one really knew about my pregnancy – that I couldn’t openly talk about what happened to us. IT was the stigma behind the socially negated loss. It felt like the saddest secret I have ever had to keep. And it enveloped me. I learned that 70% of women that experienced a loss, receive little to no support. I learned this only after I went through it. 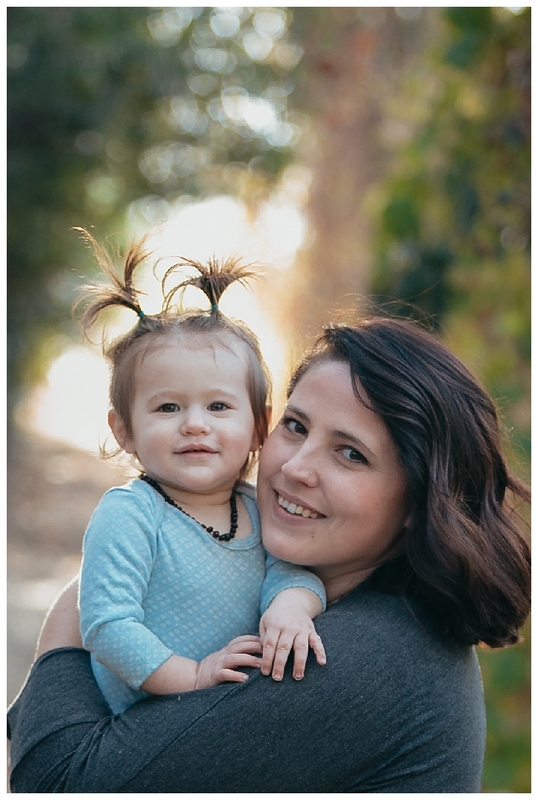 I could embark on a personal project where I could photograph other women & their families who have experienced heart-wrenching loss on all platforms. 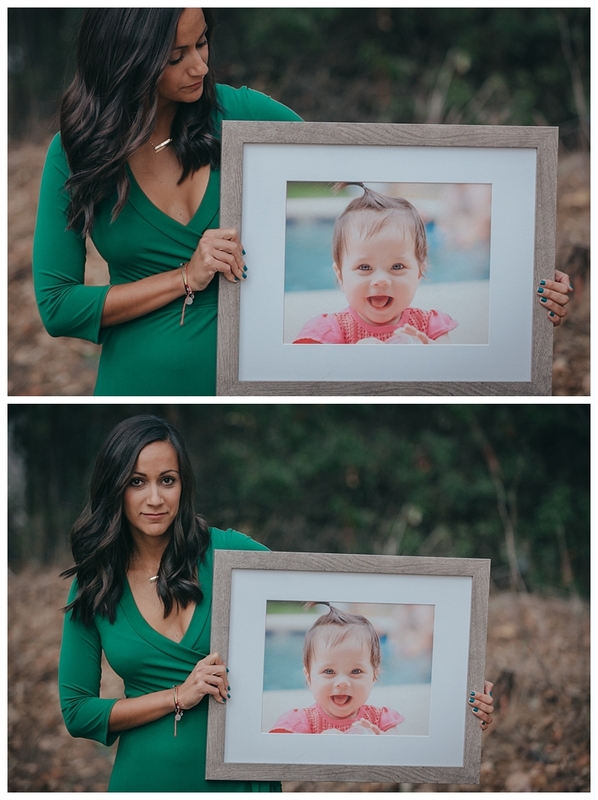 Together, we could share our stories and perhaps we can erase some of the fear, shame and discomfort around pregnancy and infant loss, infertility….birth defects. 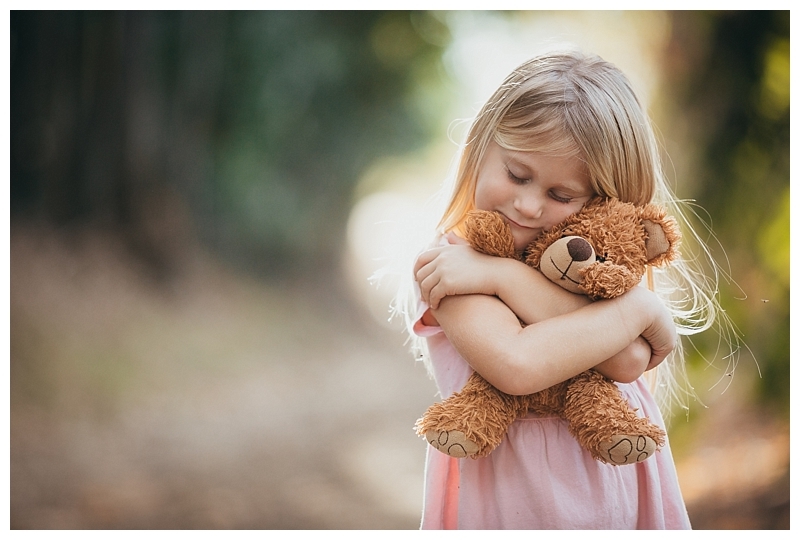 Together – we can break the silence of loss. It also occurred to me that it shouldn’t JUST be October that is the designated awareness month. IT SHOULD BE EVERY MONTH. It should be whenever we want. 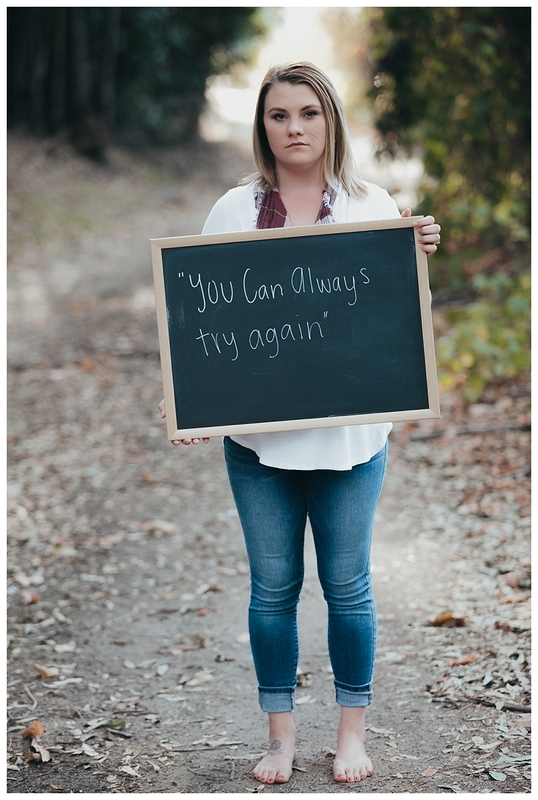 And it should most definitely not remain a taboo topic shrouded in stigma, silence, and shame. It should not be experienced alone or with embarrassment. This project was not to place blame or point fingers at anyone at all. There is no ill intentions with this project. We just wanted to create the awareness that the most straightforward changes we can make is simply to TALK about it. All we want to do is show you that you are not alone. We want to show others that we were assigned THIS mountain… because it can be moved. We are the proof. We are all women. We are all part of a ‘club’ no one asked to be in. 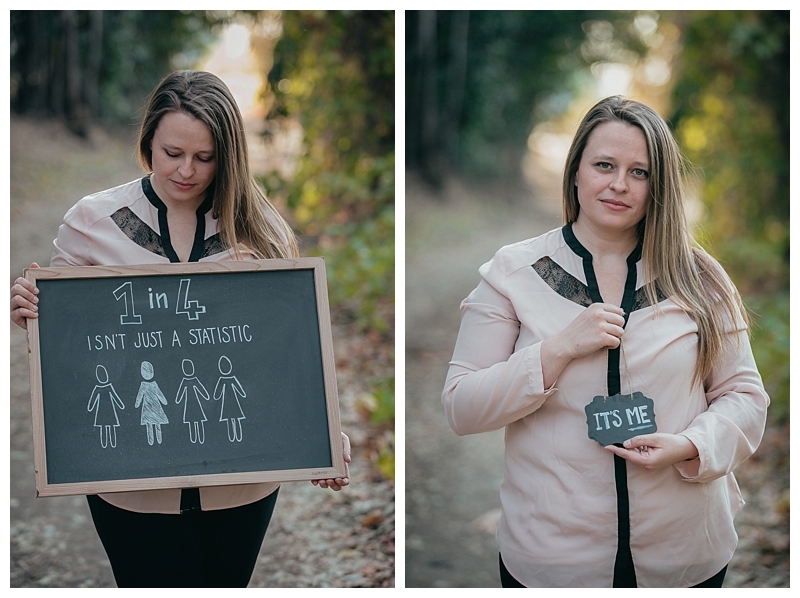 We are all Military wives… And most importantly – We are the 1 in 4. 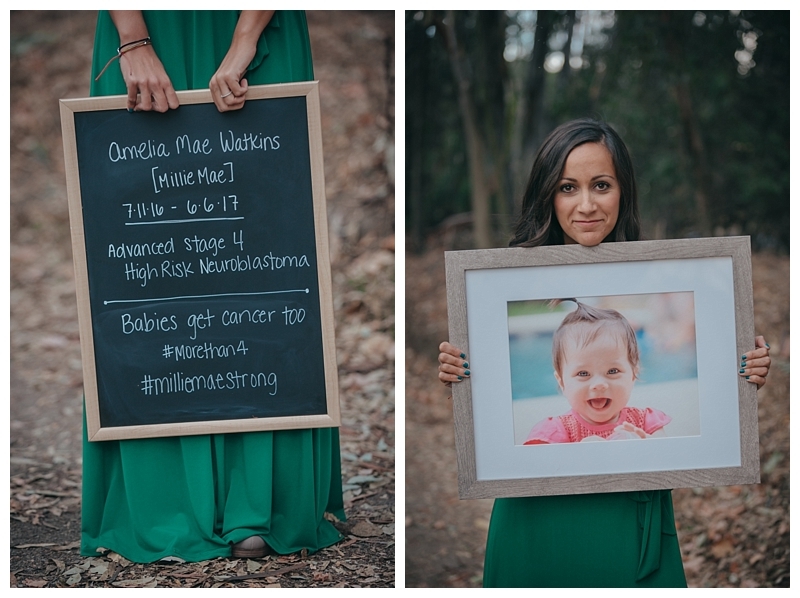 As the Watkins family moved from Virginia to California as part of John’s military orders, Millie became ill. After 10 months of showing no signs of this tumor taking over her body, It was quickly discovered that she had stage 4 neuroblastoma which resulted in tumors stemming from her kidney. She had tumor spots in her lymph nodes, on her spine, on her femur, jawbone, eye socket as well as both sides of her body in her bone marrow. 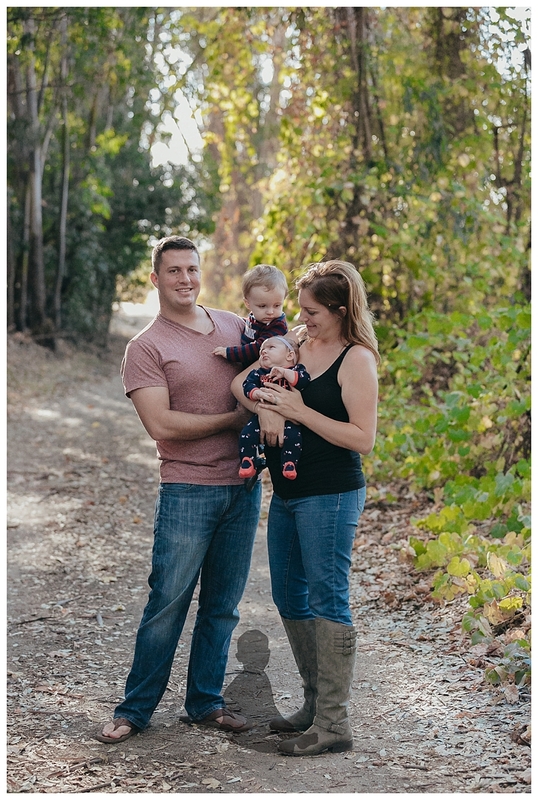 John, Jayshree, and Kaden had to continue their journey to their new home in California without Millie, something they never thought in their wildest dreams would be their reality. 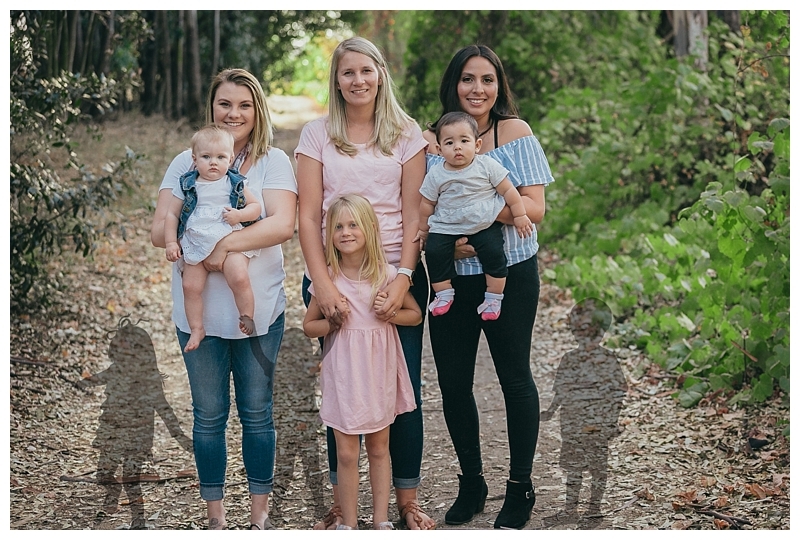 They were welcomed with open arms by those in the community, and now they have dedicated themselves to create a place for families who have experienced the same heartbreak as them, as well as raise funds to help cure this unimaginable disease. 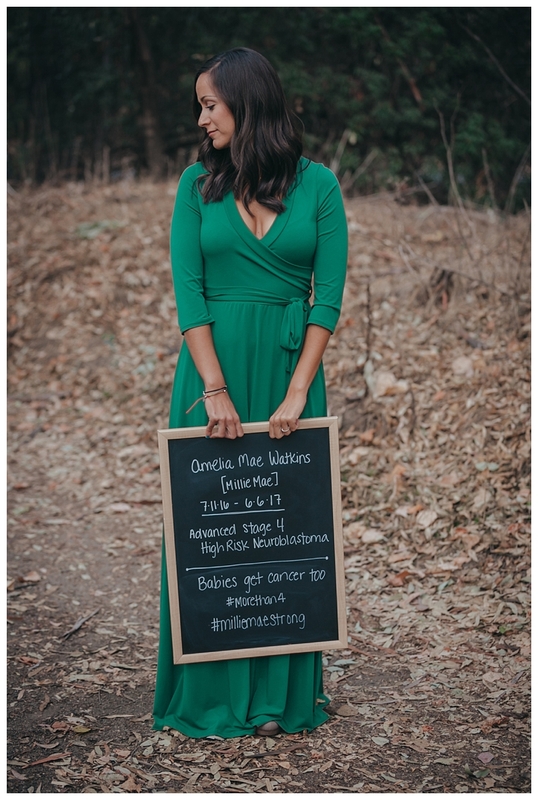 Jayshree, a USMC spouse, tells the story of her daughter Millie's short but fierce battle with pediatric neuroblastoma…. August 12th 2016 2115 time of death. – August 13th 2016 0806 time of birth. If you don’t understand what that means I’m so thankful you don’t know the pain.. and if you do I’m so sorry.. for those of you who don’t know, it’s losing a child before you even have a chance to meet them, before you hear the first cry, laugh or word, it’s knowing your gonna have a short amount of time to say hello and goodbye and you your self have to live. It’s calling family and friends to let them know before you say anything on social media, the best day of your life soon turns into the worst. 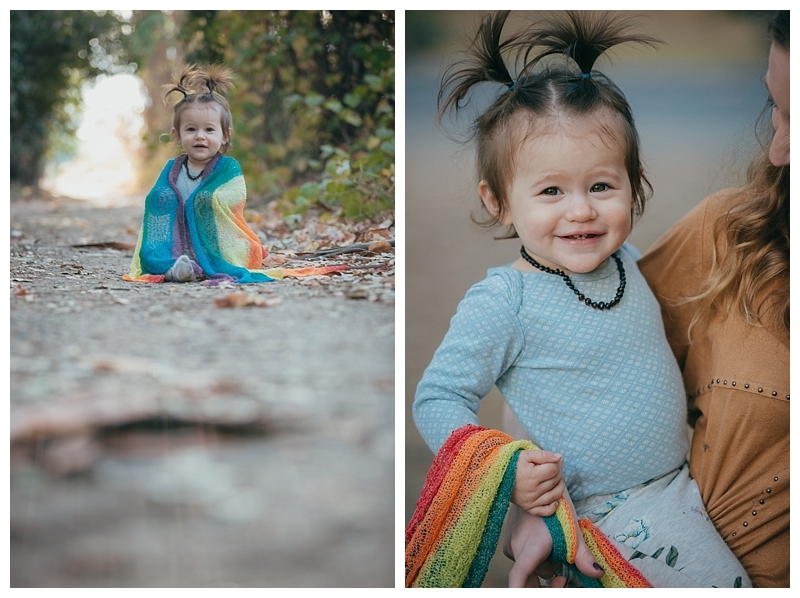 Today is Hadleighs 2nd birthday and I think I’m brave enough to tell her story. August 9, 2016 I went to Labor and delivery because I felt like I was leaking fluid, When I got there the nurse took me back to triage, they started to hook me up to the monitors and started to run all the tests that they needed. as I was sitting there hooked up I started thinking my belly really hurts and about 30 minuets later the nurse came in and told me that they were gonna have to keep me for two more hours because I was contracting and they needed to see if I had any cervical change, 2 hours came but it really felt like 5 I was still having really bad contractions but no change to my cervix so they told me if they continue the next day call and make an appointment with my OB, The whole time I was in there I was keeping my mom updated and she decided to leave the next morning. I had contractions all night and they were not letting up. August 10, 2016 I called my OB office to let them know I needed to come in because I was still having contractions, and of course they couldn’t get me in till the next day witch is actually pretty good because usually it’s takes 3 years (anyone who has dealt with a military hospital knows what I’m talking about)All day the 10th I knew something wasn’t right, just a gut feeling but I brushed it off because why would the doctors send me home if something was wrong or the baby was in danger. My contractions wouldn’t let up. I tried everything, I drank water, tried to sleep anything I could think of. I was just a big mess. August 11, 2016 and I am still contracting, so I go to the doctor I woke up with the same feeling something isn’t right, when I got to the doctor they checked her heat rate and it was 159, she said as long as it was under 160 that Hadleigh was fine and there was nothing they could do, and told me I could be contracting up to my c section date, that was 4 weeks away.. I told her i don’t know but something feels off, the doctor looked at me like I was crazy and sent me to get a non stress test and pretty much made me feel stupid and passed me off as a first time mom, after being hooked up for 10 mins I “passed”the non stress test ( knowing now I was supposed to be hooked up for at least 20 mins makes me really mad) when they did the ultrasound to check her fluid they said she looked healthy, she was moving like she always did for the camera.. little did I know that would be the last time I ever saw my baby alive and moving. when my mom asked the doctor to check the cord just to be safe she told us “that’s not in my job description” They just sent me on my way.. no one checked my cervix at all.. I was contracting all night but the doctors said I was fine and just a first time mom so I must be over thinking it right?. August 12, 2016.. I woke up and felt Hadleigh move and talked to her like I did every morning as I got ready to go shopping with my mom and sisters because they needed school clothes and I needed a few things for Hadleigh.. well later on that day I noticed my contractions stopped (lucky me right? )then I was thinking I really I haven’t felt her move the whole day except when I woke up… I told my mom and she was a little concerned. So we went back home and Anyone who hasn’t got kick counts in knows you drink cold water or juice, eat something and lay on your side to get them moving.. we even tried to have daddy rub my belly that ALWAYS WORKED! so I ate a half a banana and a few bites popsicle I hadn’t eaten much for about a 2 days because the contractions hurt so bad I couldn’t. I didn’t get any movement at all and that feeling something wasn’t right was eating at me so we all load up in the car.. we got to the hospital and of course they take me back to a room to hook me up, about 2 mins in the nurse couldn’t find a heartbeat and of course I already knew something wasn’t good.. at this point I have about 3 nurses and a doctor in the room and no one is getting anything but they keep “hearing her heartbeat” I knew it was mine they were hearing, during all this they were trying to get an IV started and it took all 3 nurses to finally get it. After my iV was in they took me to a different room and had me change so the ultrasound tech could come in and look for a heartbeat and make sure she was okay. it felt like hours before she got there.. as soon as she got to my room and looked I saw all the doctors faces and right then and there our life changed, our perfect little baby was gone. The doctor that i had seen the day before who told me everything was fine looked and me and said “I’m so sorry, there is no heartbeat and called it, August 12,2016at 2115” all I remember is screaming I told you something was wrong I told you.. why couldn’t you just listen to me. I said some other choice words to her as well, Andrew didn’t know what else to do but get that lady out of my room before I jumped out of that bed. August 13, 2016 at 0806 my beautiful baby girl was born, she was 5lbs 12oz and 18.5 inches long. I gave birth to a child that should be here with us if someone just listened to me, I was 35 weeks 4 days, she would of been small and probably in the NICU but she would of been alive. We got one day to spend with this beautiful little baby, we had one day to remember everything from the way she smelled to the way her skin felt.. all that the hospital staff wanted to do was rush our time together.. they told me they were gonna move me out of L&D and put me in the multi unit ward, when I asked them when that was gonna happen the nurse said “when you are done with your daughter but you have had a long time”, how do you put a time limit on saying goodbye to your child? We had one sad but perfect day with our baby girl, we.. we had 13 hours to say hello and goodbye. August 14, 2016 the day after I had a c section and lost our baby, we made the decision to leave, we had to leave that hospital as soon as we could all we wanted to do was go to Idaho. We had to leave our perfect little baby in a cold freezer all alone. We were given the option to see her before we left and We couldn’t. We had just met with the mortuary and We had just made the decision to have her cremated. 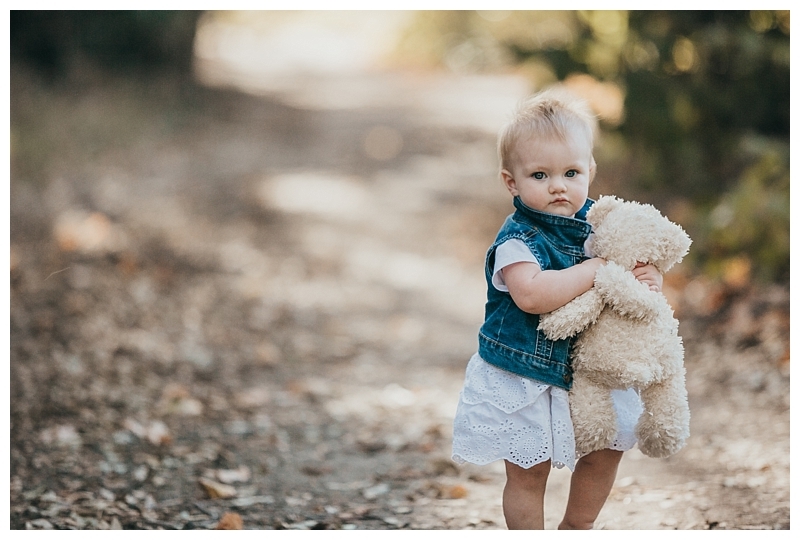 We picked a cute white little teddy bear for her to go in. The one you all see Payton take pictures with. When we got home it all hit me, it was my first time back. 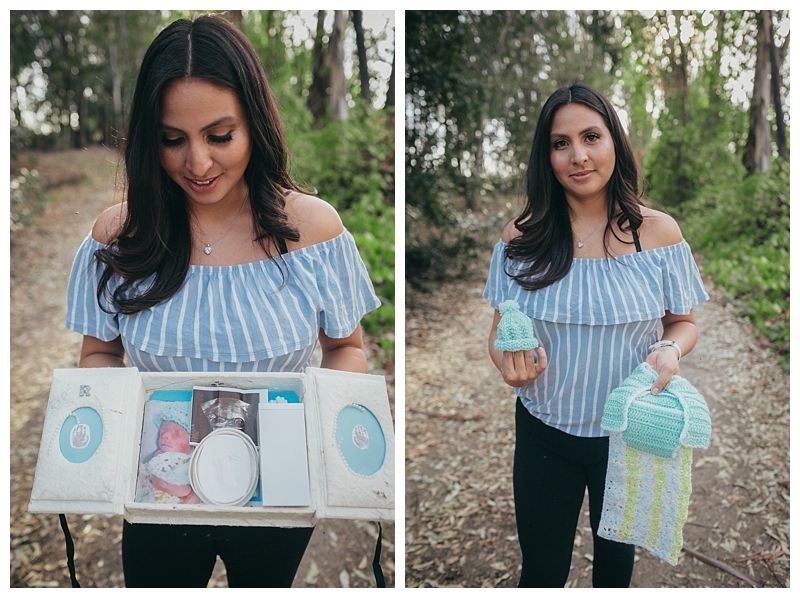 It was the first time I realized that I would never get to bring our baby home, to sleep in her perfect nursery that her dad and I worked on for months and months. She would never sleep in the crib that her daddy surprised us with. She would never get to wear her clothes or read her books. 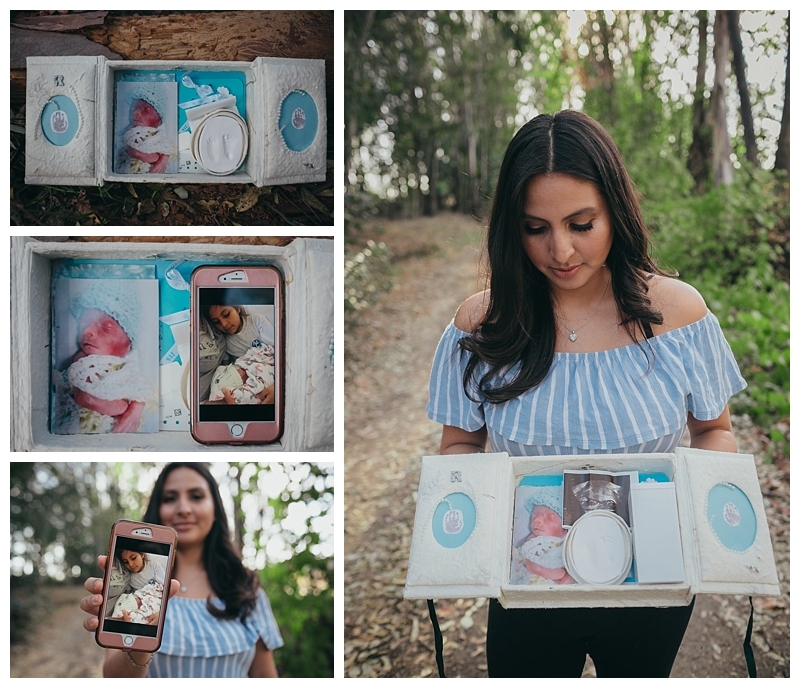 Our child’s death will always and forever be before her time of birth. 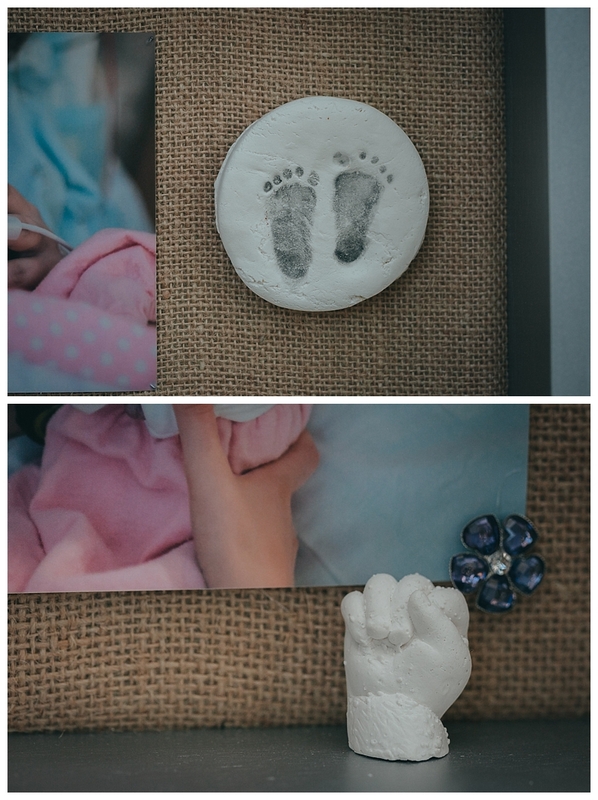 Our child was “stillborn” but she was STILL BORN.She had 10 perfect fingers and 10 perfect toes We had 13 hours to say hello and goodbye to our child that’s all the time We had to hold her, kiss her and remember everything about her, We never got the “firsts” the first cry, kiss or heartbreak … so PLEASE PLEASE PLEASE I am begging you if you feel like something is wrong with your baby go in and if they won’t listen find someone who will that is my biggest regret I should of went somewhere else , don’t let them pass it off as nothing or being a first time mom. 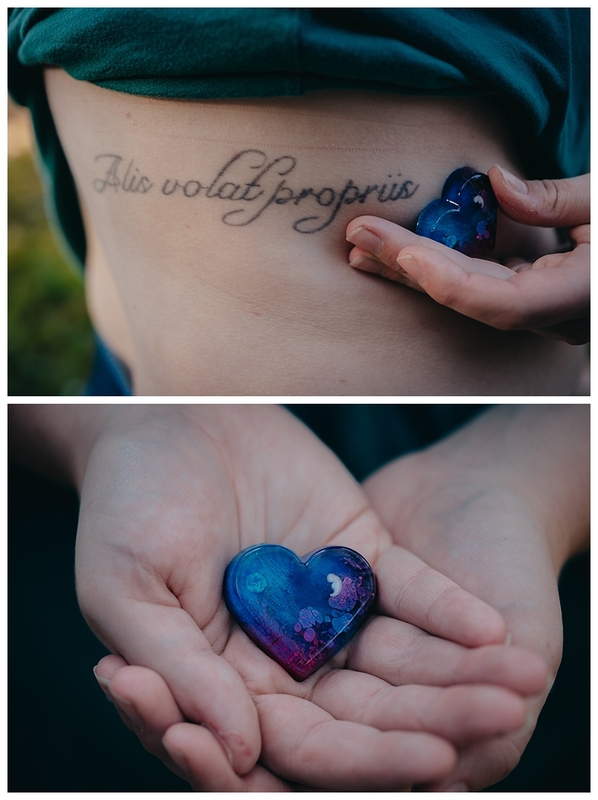 To all the people out there that have had a stillborn remember your child matters! You child is so loved. And to those of you who haven’t had a stillborn or lost a child go hug and love on those babies you have at home. No one will ever be able to replace you Hadleigh Lynn Massie you are forever our first born, we love you so much! 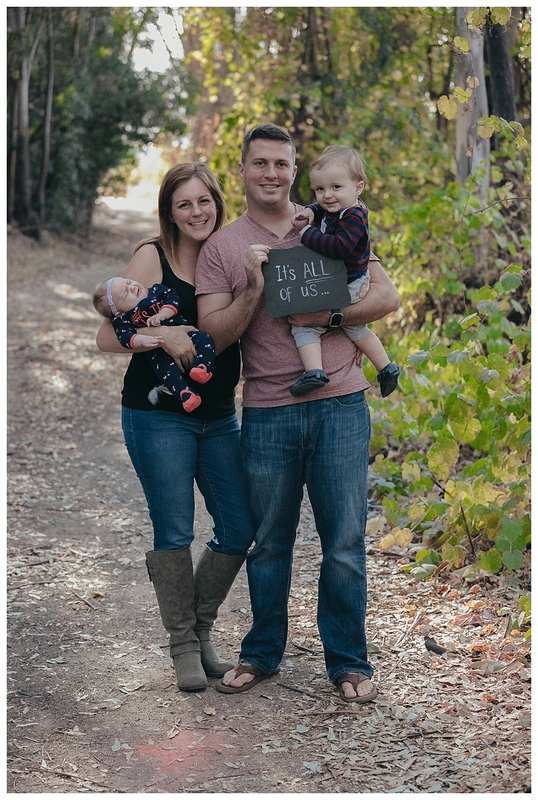 In October 2015 we found out we were pregnant with out second child, this time it only took 6 months and no fertility interventions – so to say we were happy would be an understatement. 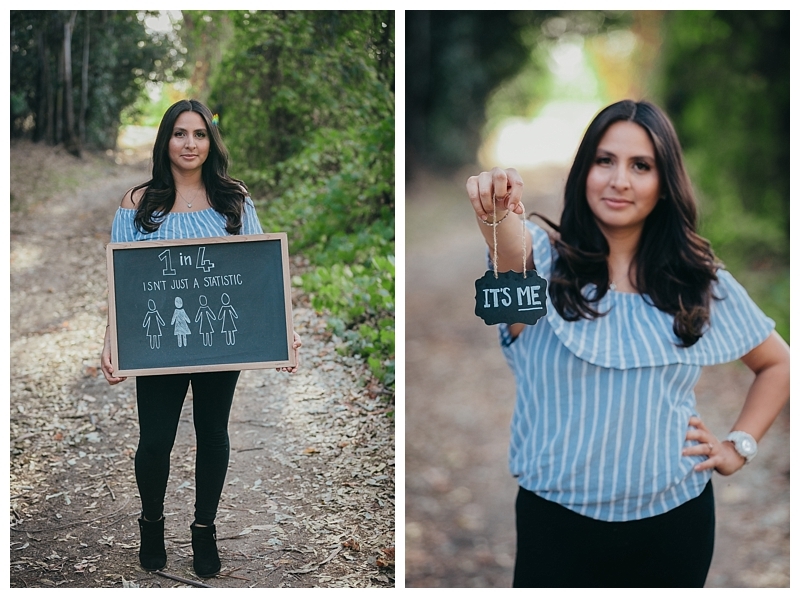 At 20 weeks pregnant with our second baby girl, we were dreaming about what our future would look like with two precious girls playing together, being best friends of course, when we went to our ultrasound appointment. 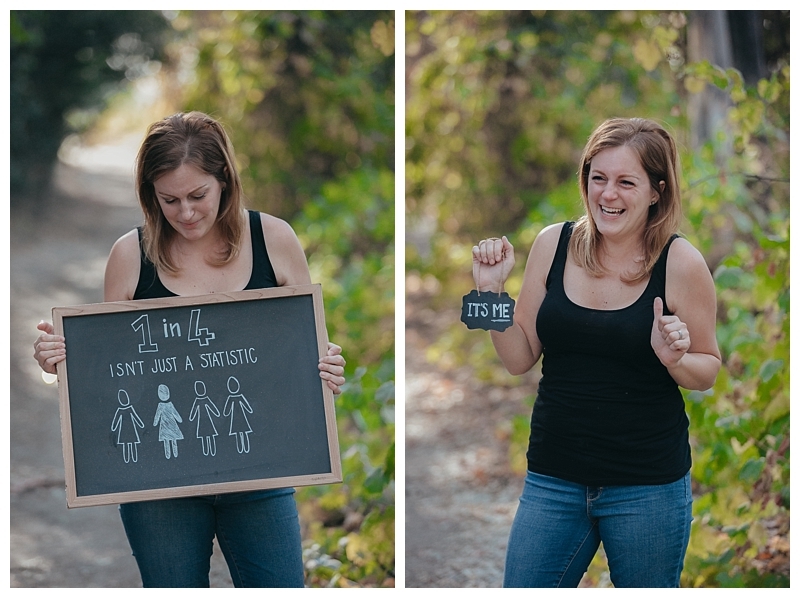 We were not expecting to be told that something was wrong with our perfect baby. 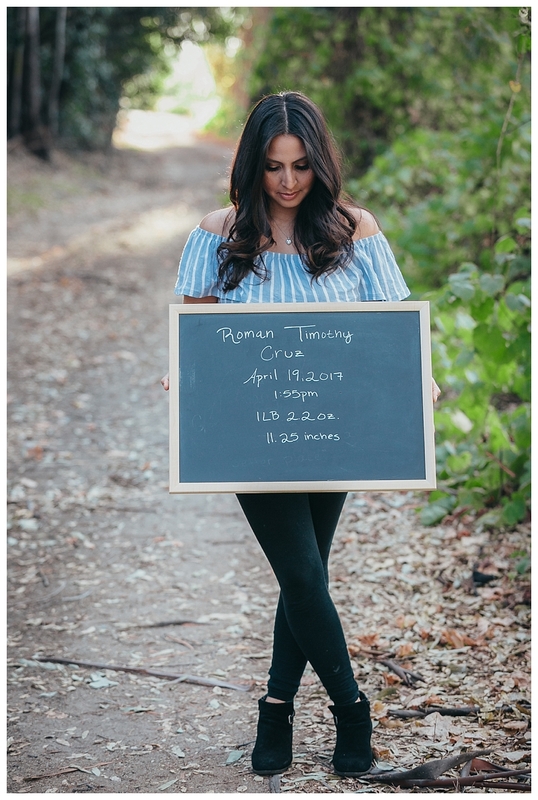 The doctor informed us our daughter had fluid in her skull and chest, wasn’t moving at all, and had many other abnormalities that lead her to believe that our baby had Trisomy 18. After shutting down the idea of an abortion, we returned to her office a week later for an amniocentesis to confirm her suspicion. Checking on the baby, the doctor noticed that her symptoms were progressing and believed she was having issues with heart, so she referred us to a bigger hospital. With a negative trisomy result and weekly appointments to check on our precious girl, we could only watch as her symptoms worsened. Week after week, test after test, there were never any answers. The second doctor advised we make a plan for her birth as soon as possible and consider the possibility of her not making it to birth or shortly after and referred us to an even bigger hospital, 2 1/2 hours away. 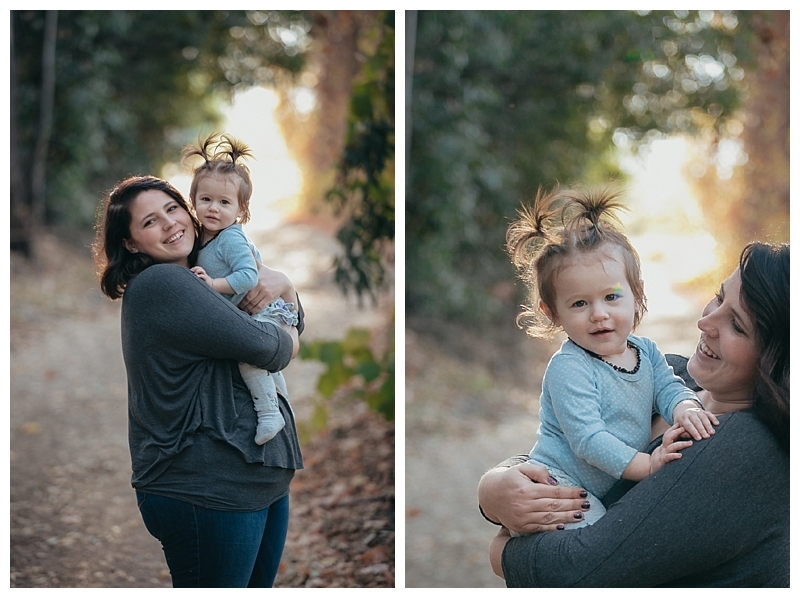 On March 30, 2015, we went to the hospital to be checked to find that I was leaking fluid due to the baby’s inability to use to her muscles to circulate the fluid in my body. Due to some “persuasion” from my husband, the baby and I were life flighted to Chapel Hill Hospital. 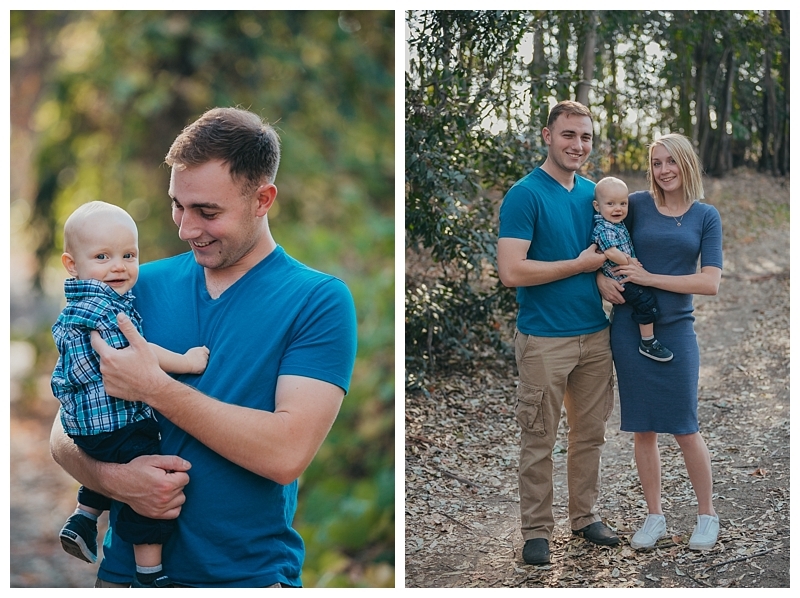 When all of our family had arrived, it was time to have our baby. 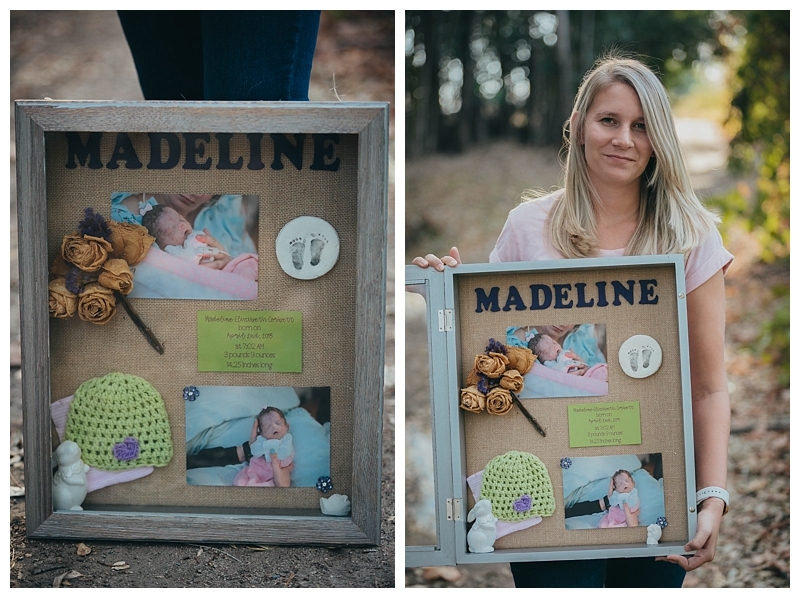 On April 2, 2015, Madeline Elizabeth Corbett was born at only 31 weeks. Although her heart worked, she had no use of any other muscles in her body and could not use her own lungs to breathe. She was baptized and handed to us to hold while we could. An hour later, with no heartbeat, we were told that she had passed. 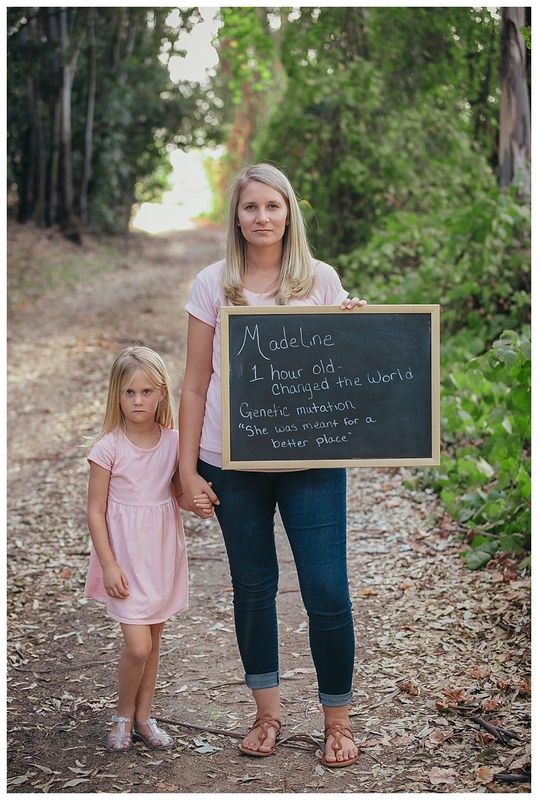 We later learned, due to a research study being conducted at the hospital, that Madeline’s symptoms were due to a genetic mutation on her MUSK gene, the gene that equips your brain to tell your muscles what to do. There is a 1/50,000 chance of having a mutation on this gene, both her father and I have differing mutations on the same gene and she inherited them both from us. Madeline Elizabeth was a tiny 3lbs 9oz and 14.25 inches long. She only spent a little over an hour in this world, but she only knew love. Her strength and heart have touched so many lives and brought so much to our lives. 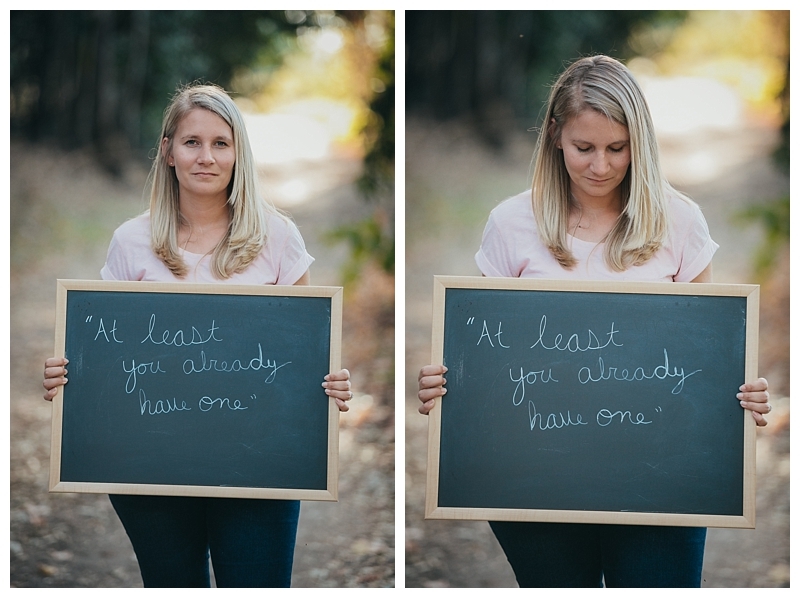 I think the worst thing people have ever said to us was “at least you have another one” or at least you have her” referring to our first daughter. It’s not a club anyone ever wants to be in but somehow it’s always uplifting and powerful to know you’re not alone. I lost my baby boy last year in July at 31 weeks 4 days. 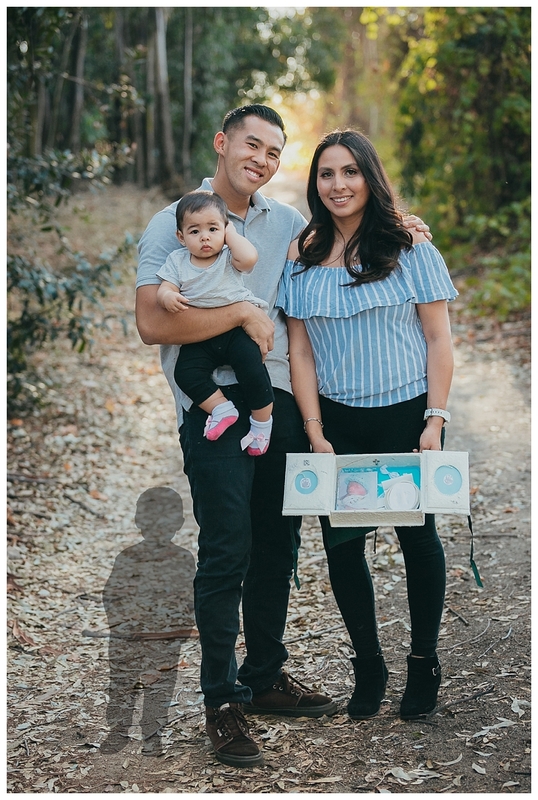 He had a rare disease called hydros fetalis that we found out when we were in Japan at the 20 anatomy scan.. the Japanese dr said that they “abort babies who have this rare disease” and we don’t believe in that so we got medivac’d to Hawaii then PCS’d here. After we moved here he has passed away and I delivered him down at Balboa Hospital. We got him cremated and have his little urn in a curio cabinet in our home with the blanket he was wrapped in at the hospital. 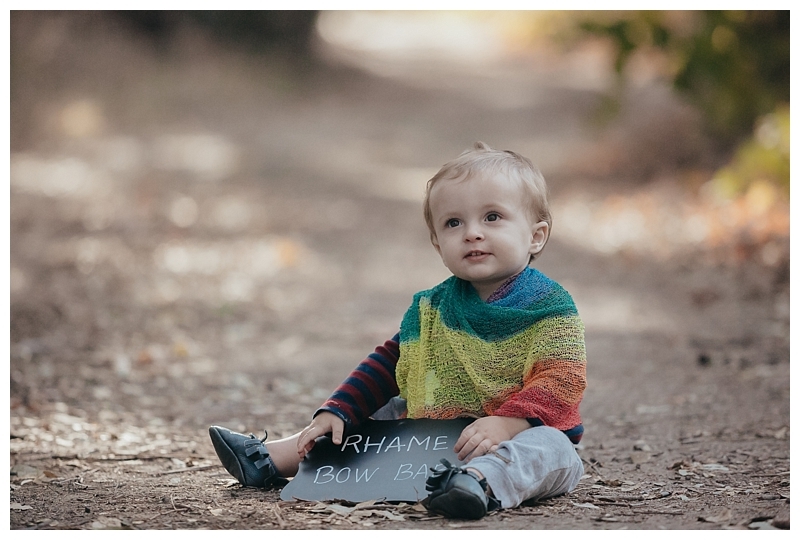 A few months after delivering him we found out we were pregnant with our rainbow baby and had him this August. To me it doesn’t matter if you lost your baby at 1 week pregnant or like me almost 8 months pregnant, you’re still a mama. That baby was carried by you and you’re a mama no matter what. 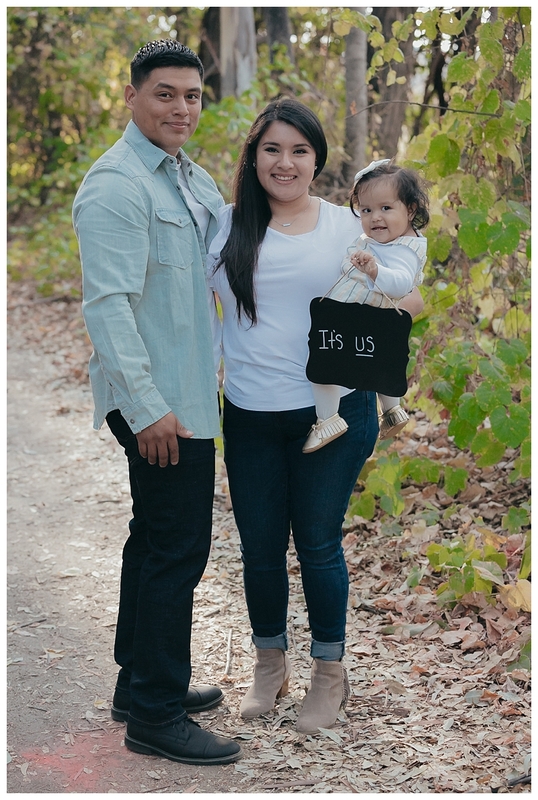 In the beginning of January 2017 my husband I found out we were pregnant with our first we were caught by surprised but so ecstatic with the thought of becoming parents. January 19th I started experiencing severe pain and slight bleeding so I went to the ER where they concluded I had a miscarriage I was so overwhelmed with the heartbreak of my lose but the Er doctor told me I was barely pregnant and before he left he turned to my husband and said “get her a tissue”. 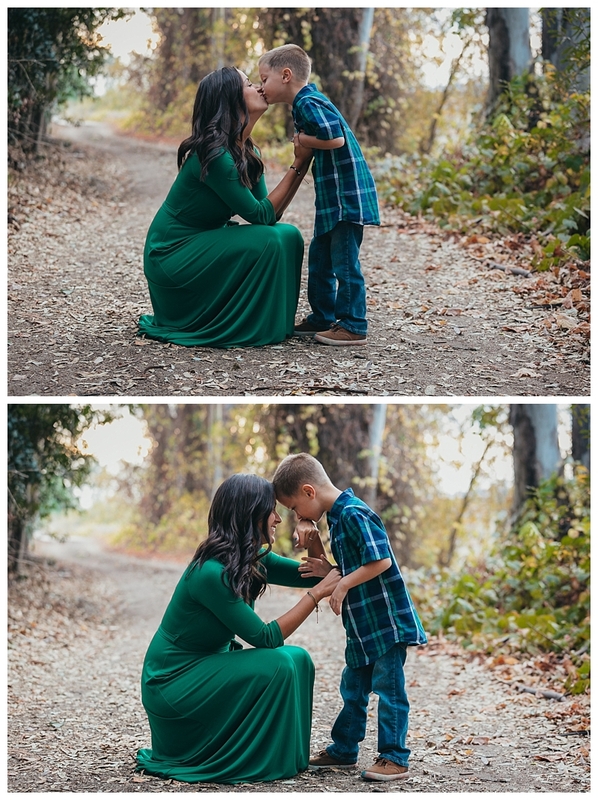 About three months later we found out we were pregnant with my son Turner. 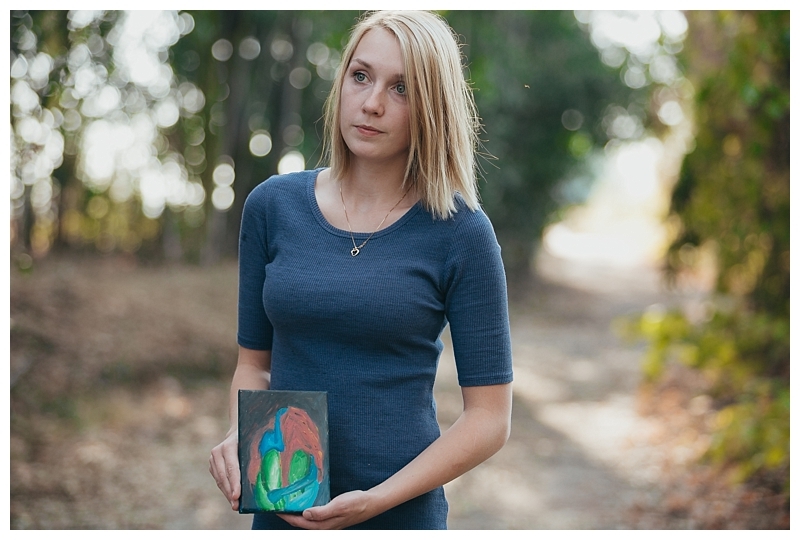 My painting I brought is something I painted after I found out I had a miscarriage. 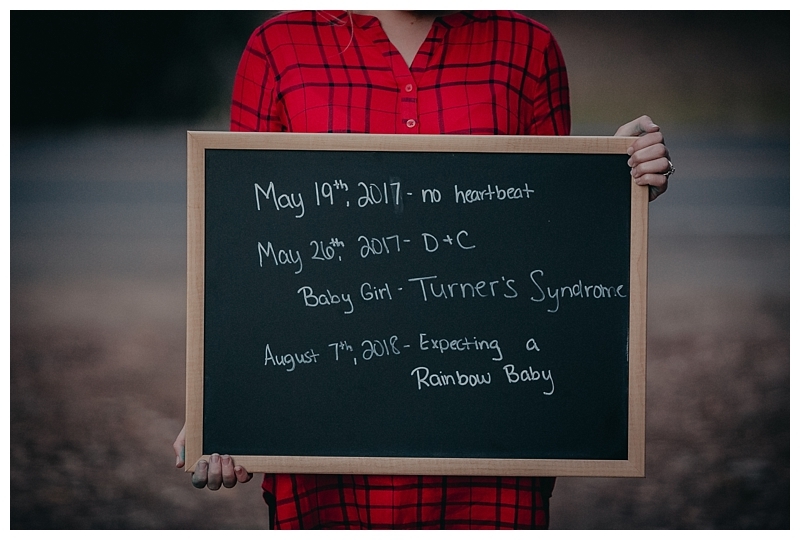 Towards the end of 2016 I found out I was pregnant. 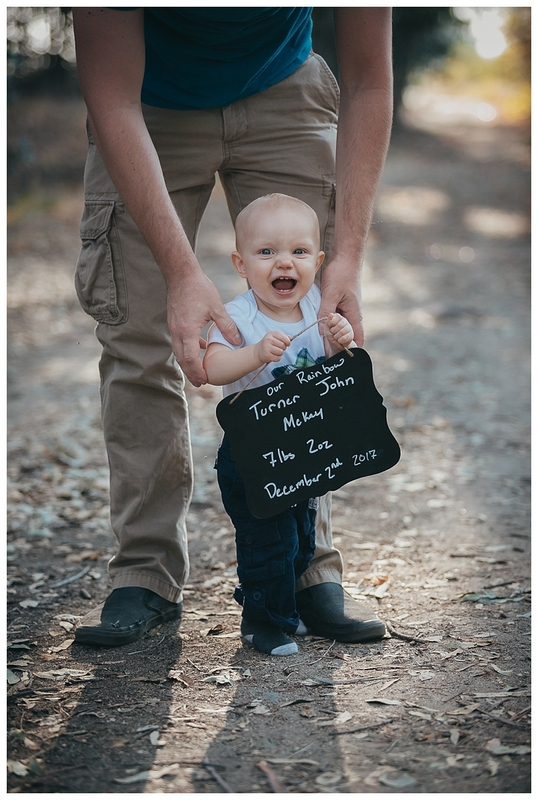 My husband and I were 24 at the time and pretty excited since this would be his first child. I however had a child from a previous relationship, Ruby Juliett, she was 5 at the time and very excited to be a big sister. I went to the doctors and had regular check ups and then I was asked if I wanted to do testing for any abnormalities. I was told it was an optional thing, but since I had no complications with my daughter I figured why not. The doctor said if we decided to keep him that he may not survive the pregnancy or the birth, but if he did he would at most be alive for 2 weeks. We were told we had to make a choice soon because the cutoff for the surgery would be at 24 weeks, and I was coming up on 24 weeks. 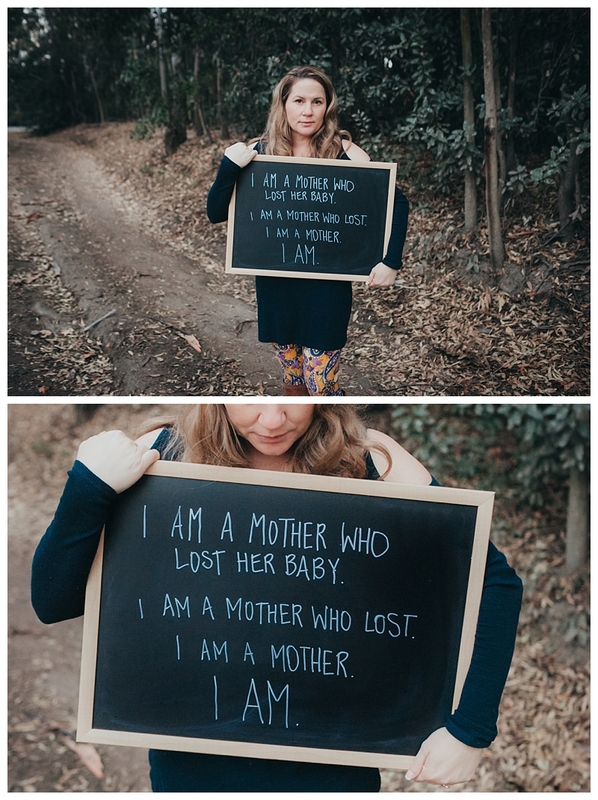 This was heartbreaking but I didn’t care I still wanted to go through with the pregnancy. Our other options were having a DNC or what they call a “therapeutic abortion”. A little side story. My husbands brother is autistic and has asperger syndrome, so he took in account that growing up and seeing how others treated him and got bullied he didn’t want our son going through that as well. So we decide to go through with the therapeutic abortion which consisted of going to another specialist and stopping the baby’s heartbeat and then getting induced and giving birth to him. The doctor said it would take a few days maybe even a few weeks to get an appointment to do it so I left my appointment and started driving home, I was feeling slightly groggy from the news. About 10 minutes out I get a call from the other specialist office and was told they had an appointment the very next day. I was shocked but it seemed like the better and honorable choice considering getting a dnc is graphic for lack of better words. I gave birth to Roman April 19,2017. I remember thinking please, by some crazy miracle let out a cry. 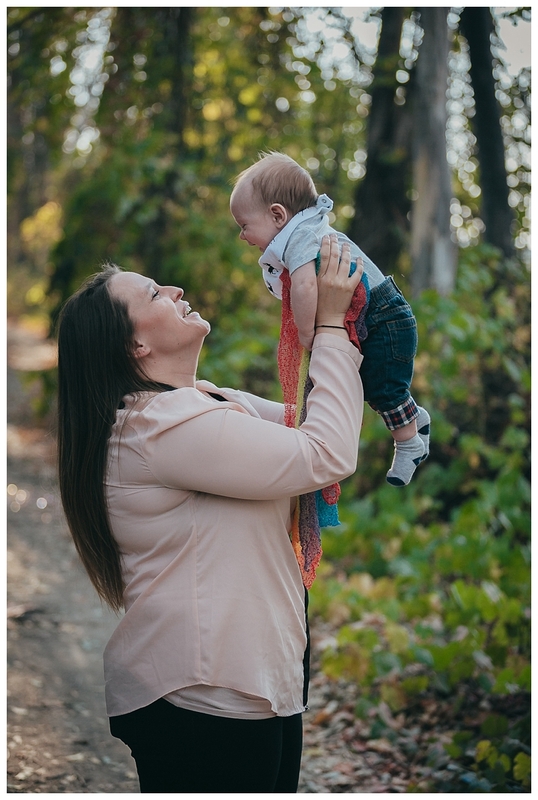 Not hearing anything after giving birth was probably one of the most devastating empty feelings as well as when I got discharged and got wheel chaired down to the car and coming home empty handed. 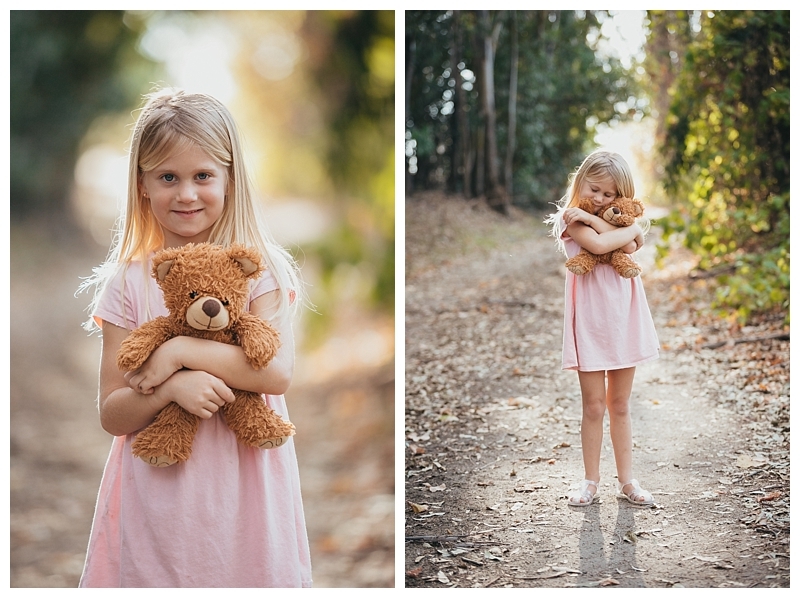 I do have a 7 year old and she was very excited to be a big sister and very involved, I was open with her about everything and she was understanding. I did feel like I had to explain to her teacher about concerning behavior that may happen due to losing her little brother. That was hard to do just days after it happened. They did an autopsy and diagnosed him with polycystic kidney disease. On the ultrasound there were only 2-3 after the autopsy they found almost the entire kidney full of them. 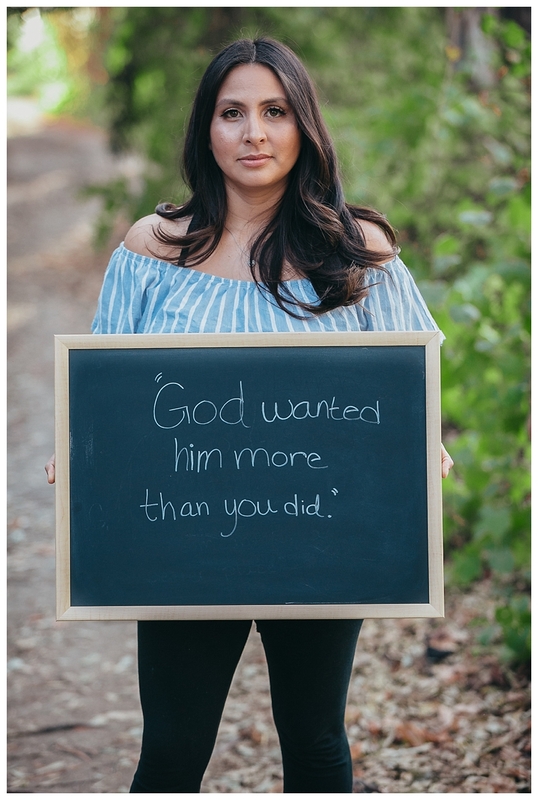 I know a lot of people talk down or tell me it’s my fault because I chose to have an abortion, but I chose what I and my husband felt was the right thing to do at the time. I was allowed to hold him and stayed in the hospital with him for almost 2 days. 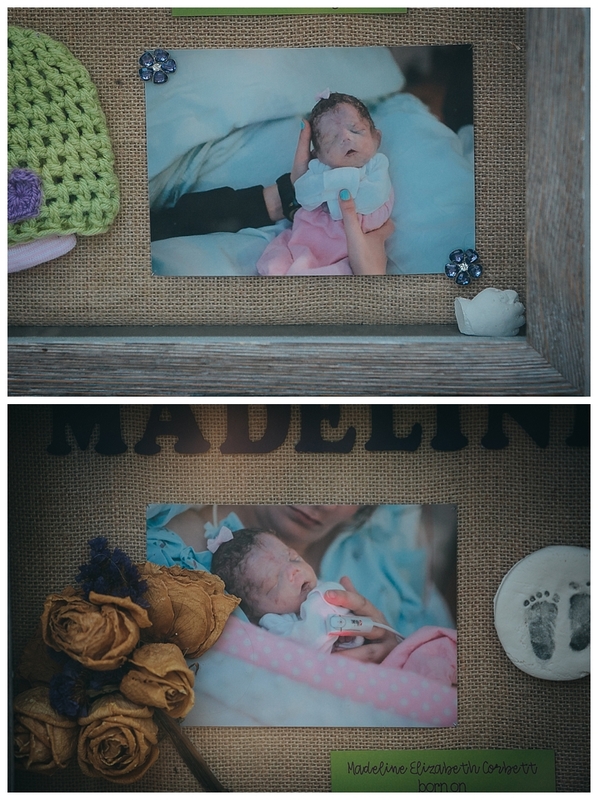 The hospital took some pictures and gave me a memory box to keep. It’s a great thing for them to do and I completely appreciate the nurses for being so kind and caring, they were absolutely amazing! My husband & I were pregnant last year but unfortunately lost our baby at 4 months. testing after the fact revealed it was due to turners syndrome. 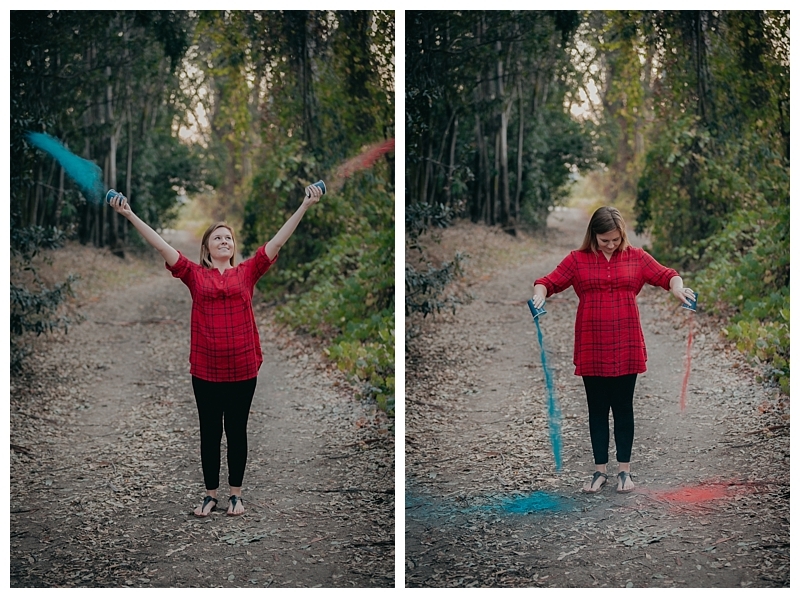 We are currently pregnant with our rainbow baby! 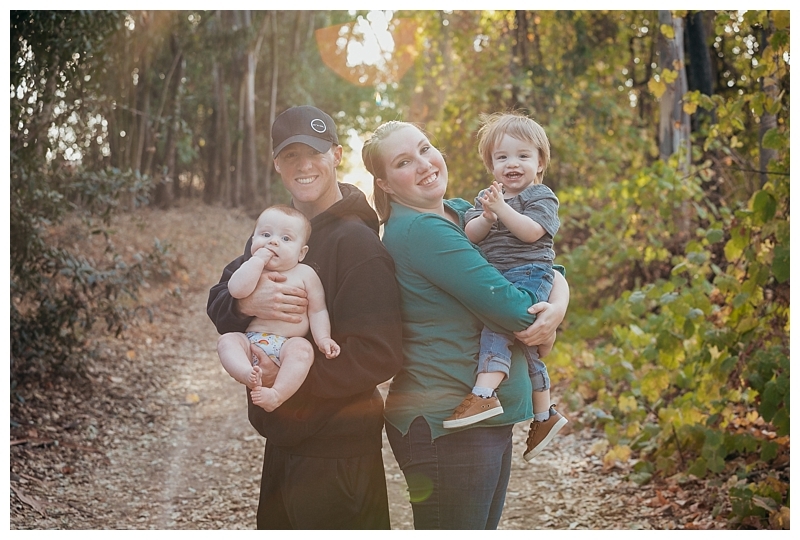 I was only four months postpartum from a rough pregnancy and premature delivery. 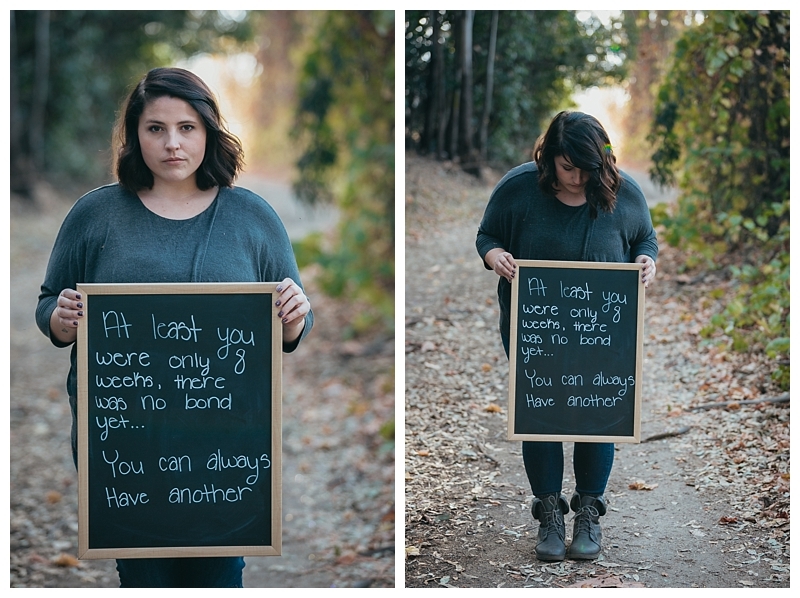 Knowing my body was weak, I already didn’t have high expectations for the pregnancy. But I had hope, we even went and bought an SUV so we could fit our two young children. Unfortunately five days later, plans changed. A little spotting on Saturday night turned into heavy bleeding. We went to the ER, hoping by some miracle the pregnancy was still viable. 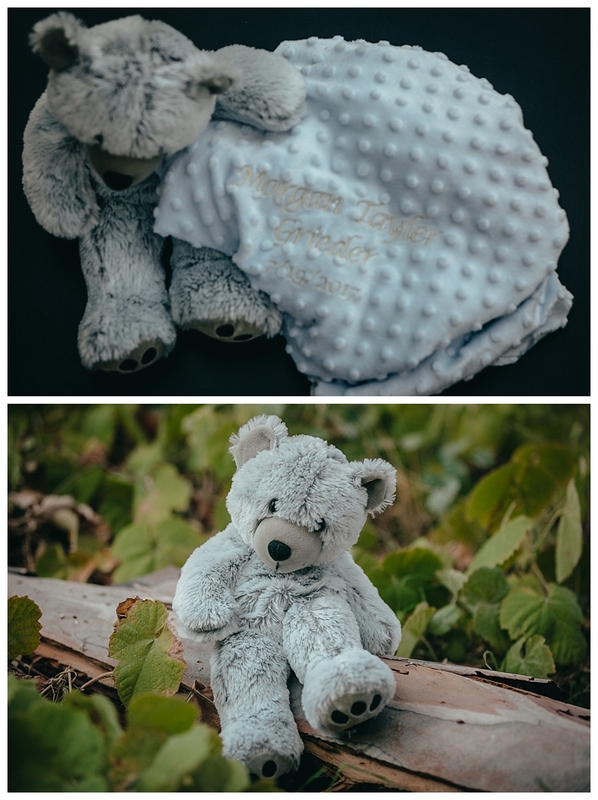 Three hours later, it was confirmed that we had lost our baby. The doctor with probably the worst bedside manner said “it was a chemical pregnancy” because I was only 6 or 7 weeks along. But the way her face and tone read, she might had well have thrown the word “just” in there. 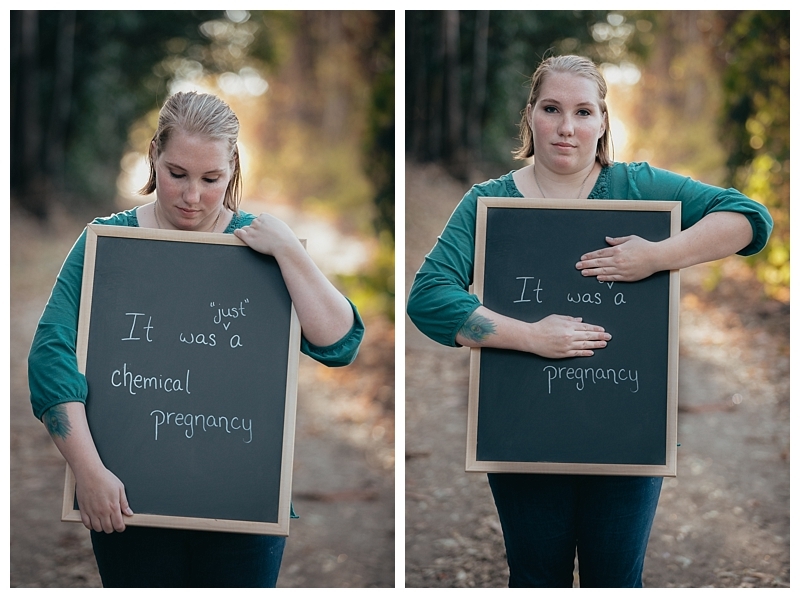 It was “just” a chemical pregnancy. The other words that cut me later on when sharing the news of our loss were that “at least we have more time with our first”. Like, the fact that my firstborn is so young makes the loss hurt any less? 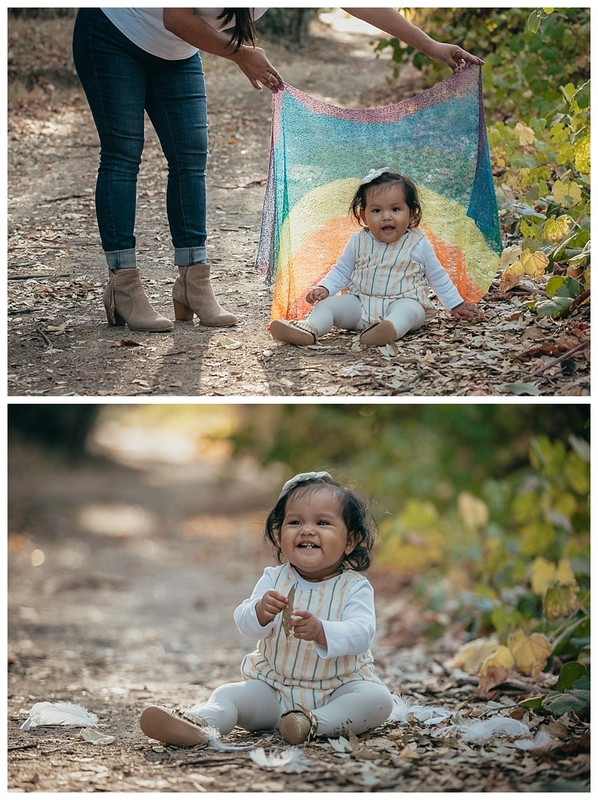 Two months later we were blessed to find out we were expecting our rainbow baby. We now have two amazing little boys that make my heart swell with joy. I can’t help but laugh when people say I must have my hands full with boys 13 months apart, the oldest having autism and a large amount of therapies a week. Little do they know, my kids were “supposed” to be less than a year apart. 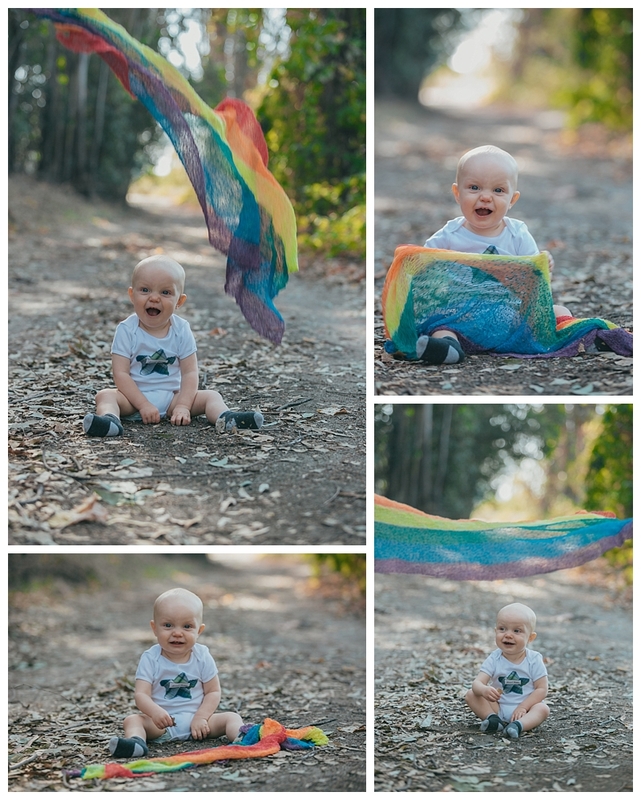 My loss being early, the fact that I have my first son or even my rainbow baby, doesn’t mean that the loss hurt any less or means any less. 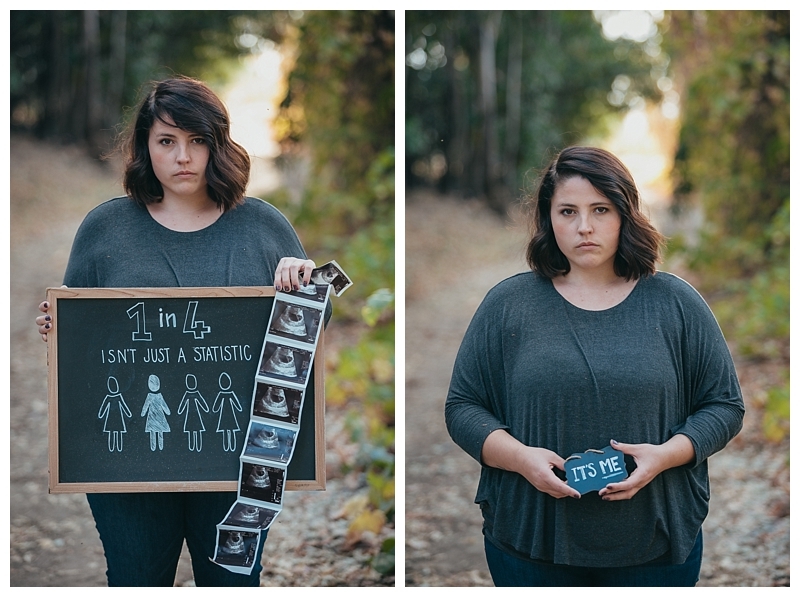 I am 1 in 4 and my baby still matters. My name is Jessica; I’m a mother of a beautiful baby girl named Ailani. I also happen to be a mother to three beautiful angles, Angel, Jael, and Ash. 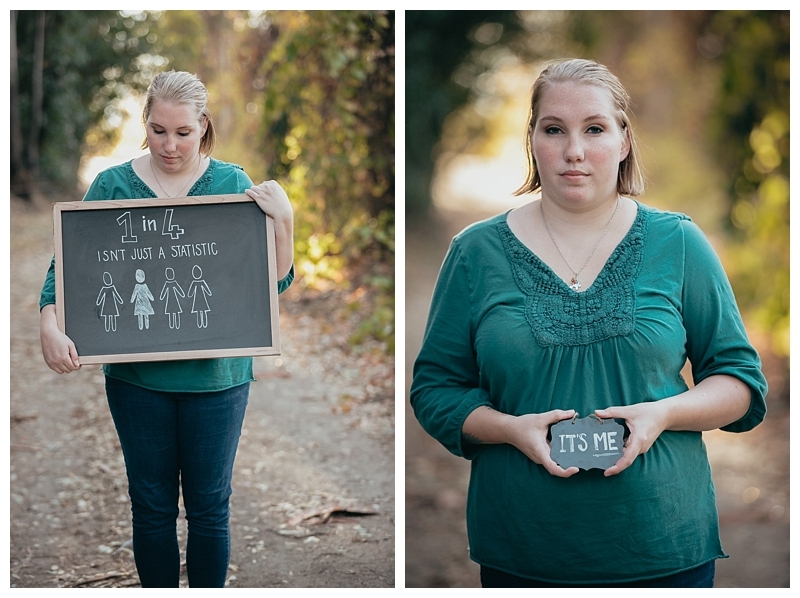 My journey started when I was diagnosed with PCOS/Infertility. 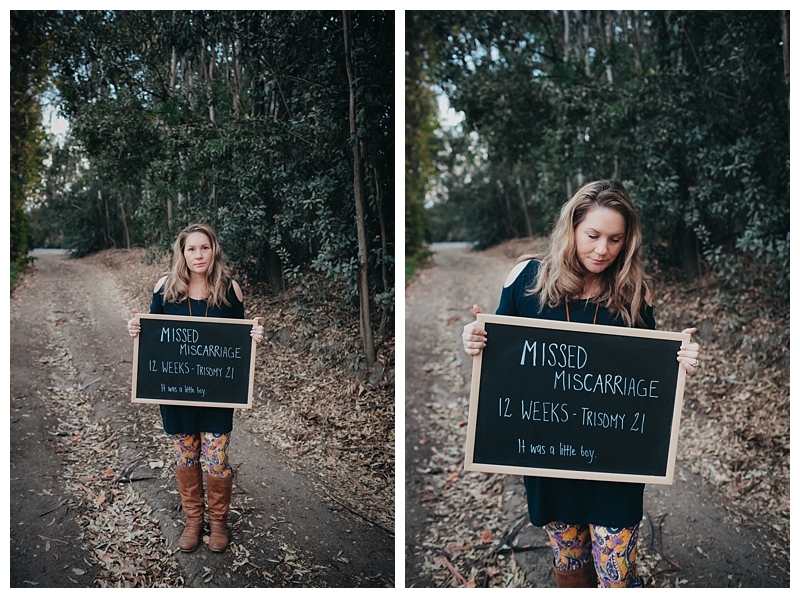 My first two miscarriages were spontaneous miscarriages, I had no idea I was pregnant. 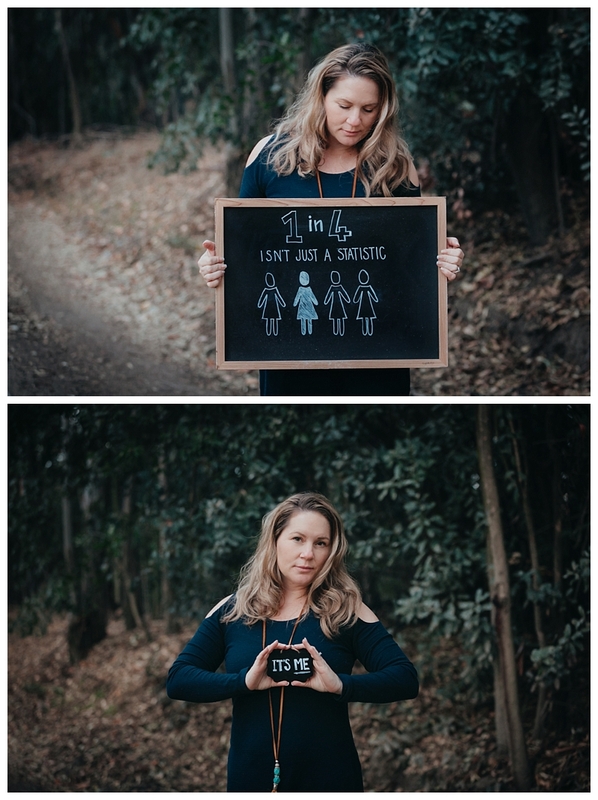 Due to PCOS I can’t maintain a fetus on my own. Nonetheless, I heard things from those close to me that hurt. “It’ll happen, it just wasn’t the right time,” “God knows why he does things,” “Things happen for a reason,” “It wasn’t even a baby yet,” “The baby wasn’t healthy aren’t you happy it ended early?” Both times I hit depression, and so many thoughts went through my head. What if THEIR baby died? What then? I would be the mean one to ask that right? But they didn’t think about what they said. However, Ash, Ash was a complete different story. Ash was conceived with a fertility treatment. 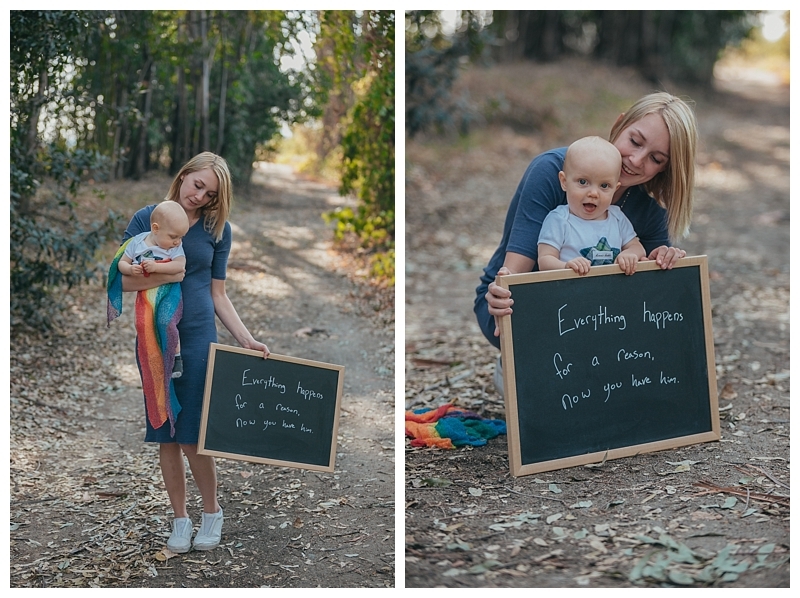 We were told we were pregnant at exactly two weeks, we did everything the doctor told us to, and we both cried because we had lost hope at one point. We immediately bonded with our unborn baby, just like any happy couple we started to make plans, brainstorm names, etc. Little did we know…he wasn’t going to make it. At 14 weeks, the start of my second trimester, he passed away. 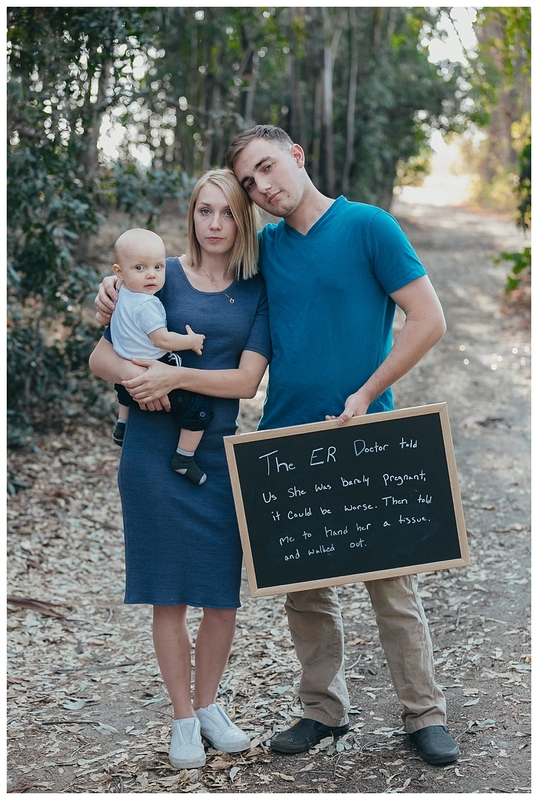 My heart shattered into a million pieces, I had to induce my own miscarriage, spent the night bleeding my life away, just to find out that I would still need a D&C. I completely lost it after the recovery. I cried for weeks, months, I gained weight rapidly, depression came like a mean wave, and then I started hearing the same comments from those close to me again. Though, one particular person, I will always remember. This person asked me what had I done to lose my baby, proceeded to tell me I wasn’t made for it, and blamed me for the entire thing. Had the nerve to let me know how I shouldn’t be a mother. A miscarriage not only hurts physically, it hurts emotionally, and mentally…it hurts like hell! Tact is something people should practice in situations like ours. 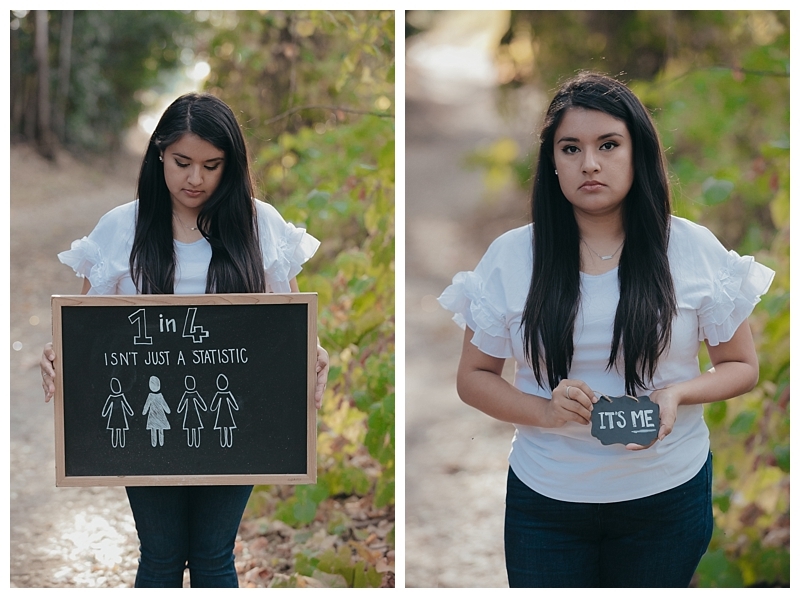 It wasn’t “just a miscarriage,” I can’t “just get pregnant again,” I didn’t “lose a pregnancy,” and I sure as hell can’t “just get over it/ move on.” Why? Because my baby DIED. How would these people feel watching their baby’s heartbeat, and next time just watch the screen with no heartbeat, nothing but silence? Sometimes it seems weird to people when I mention that I named my angel babies. I named them because they lived, they existed, they were a tiny life, a tiny heartbeat; and just like any mother I love my children. I am 1 in 4, and to these people who have the nerve to say hurtful things, should be glad they don’t understand. It’s an Angel Mom thing. I was 10 weeks along with our beautiful baby when I had an awful feeling that something wasn’t quite right. So I rush to the doctors and sure enough, my baby had no heartbeat. 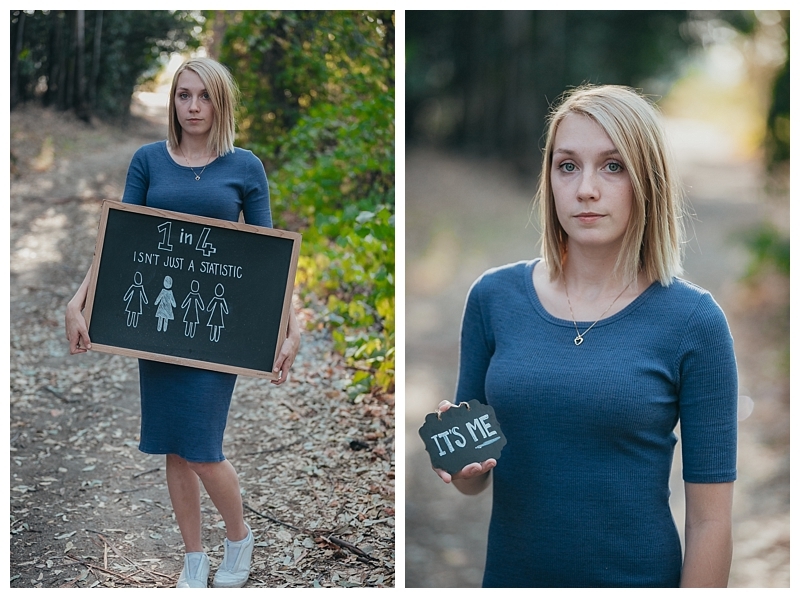 The doctor estimated a miscarriage around 8 weeks. I had been walking around with my baby dead inside of me for two whole weeks. A wave of anguish washes over me, and all my doctor said was “stop crying so I can take my pictures”. And left soon after. My husband, Johnny, was going through his own grief, and trying to figure out how to deal with a broken wife. He thought he would have to check me into a hospital because all I could say for 3 days was “I killed her, I killed my baby”. I absolutely blamed myself. 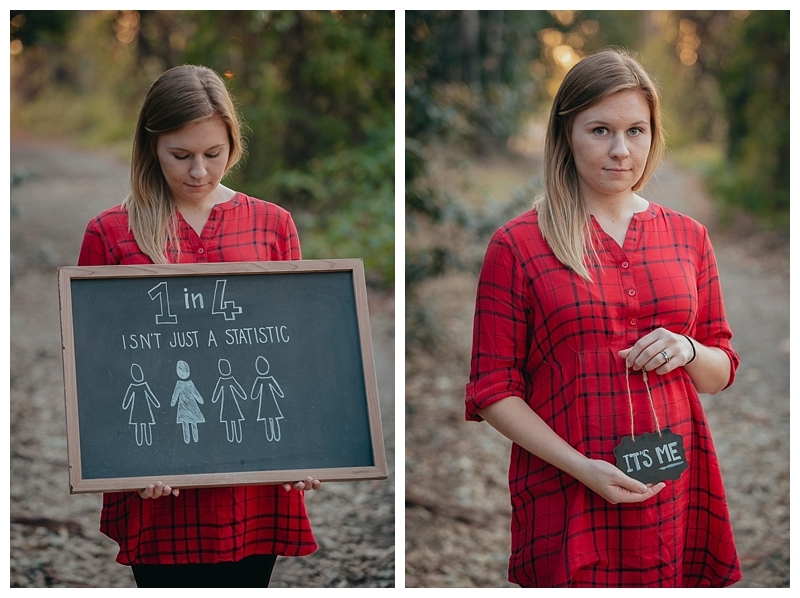 My mother said I brought it on myself because I didn’t want to tell people about the pregnancy. Like I was expecting to miscarry. Johnny left for boot camp 12 days after I had the D&C and I had to grieve the loss of my baby alone. 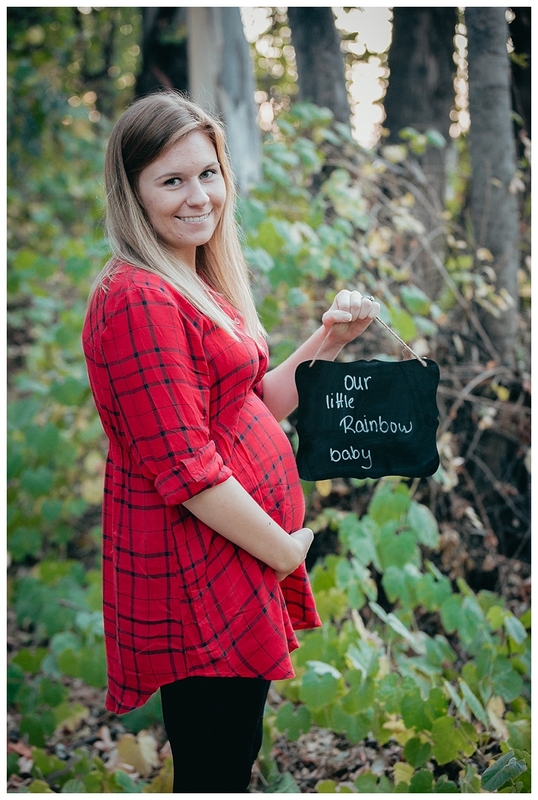 We got pregnant with our beautiful rainbow baby soon after he got home from boot camp. But we still celebrate the one we lost. Such a beautiful little life, gone all too soon. Mommy and Daddy love you Jocelyn Clementine. 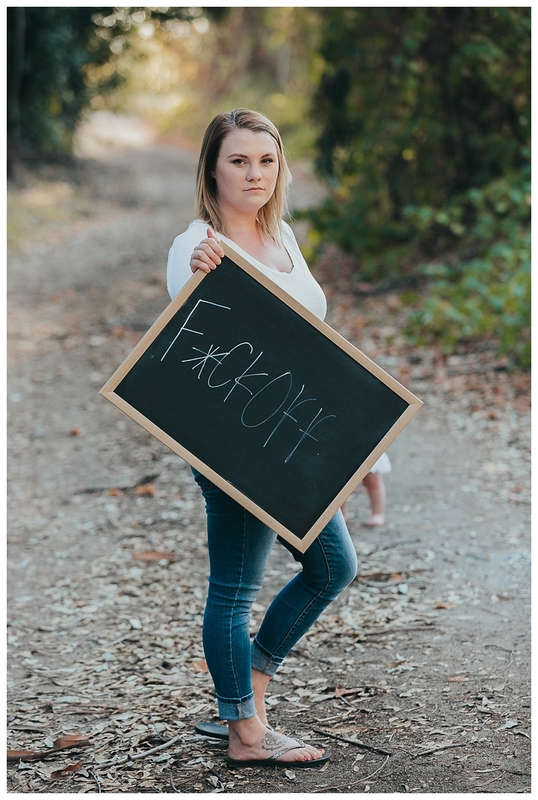 I almost didn’t do this project. I have gone back and forth for months debating whether or not I should post this. I even asked my husband if he thought it was a good idea. I have been overcome with pain, panic, sadness and embarrassment typing this. Deleting and typing, deleting and typing. I have spent the last 3 months looking at beautiful pregnant bellies and thinking ‘you have no idea how lucky you are’ and then I have smiled at those women – and sobbed in the car the moment I was out of sight. I have always considered myself a strong person. I’ve been faced with some tough things in my past and I have always found a way to accept, adapt and overcome. 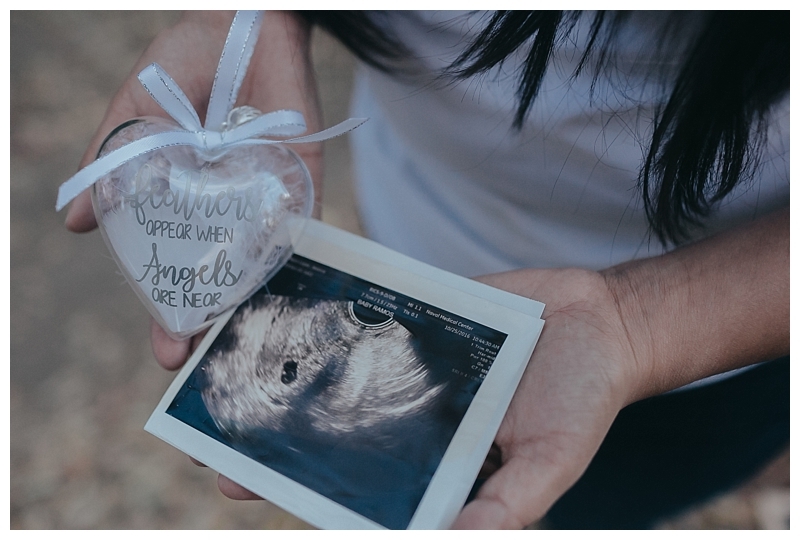 But absolutely nothing prepared me for the feelings that would envelope me the day I laid on that cold ultrasound bed and watched as the sonographer desperately try and find a heartbeat. I looked at her and she moved the wand all over my belly, zooming in and out. I knew what she was looking for. I could see she was panicking. Processing the dreaded words she would have to tell me in just a moment. 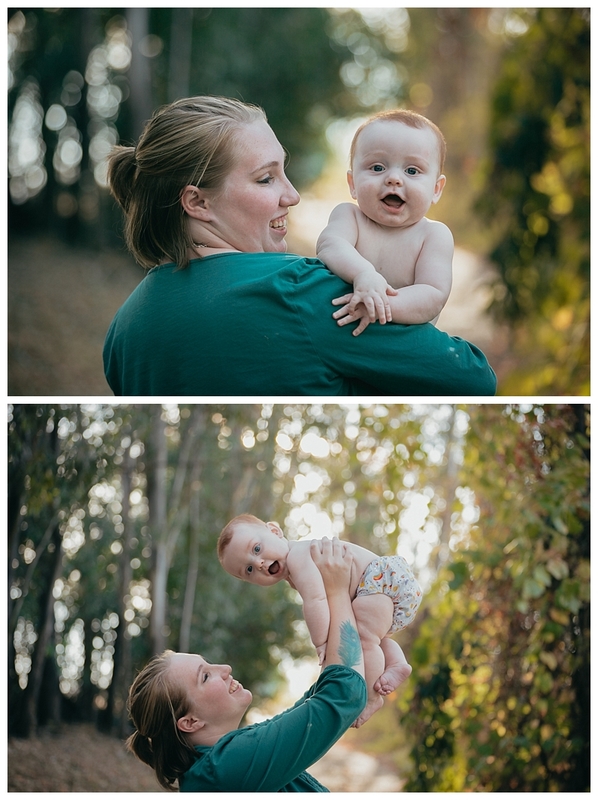 She handed me the very last pictures I would ever get of our little boy and I left. I couldn’t even cry I was in so much disbelief. I counted every single brick on the wall in the ER room 14 times over as the Doctor mumbled words to me I didn’t hear. I counted the steps to the car as my nightmare became reality. 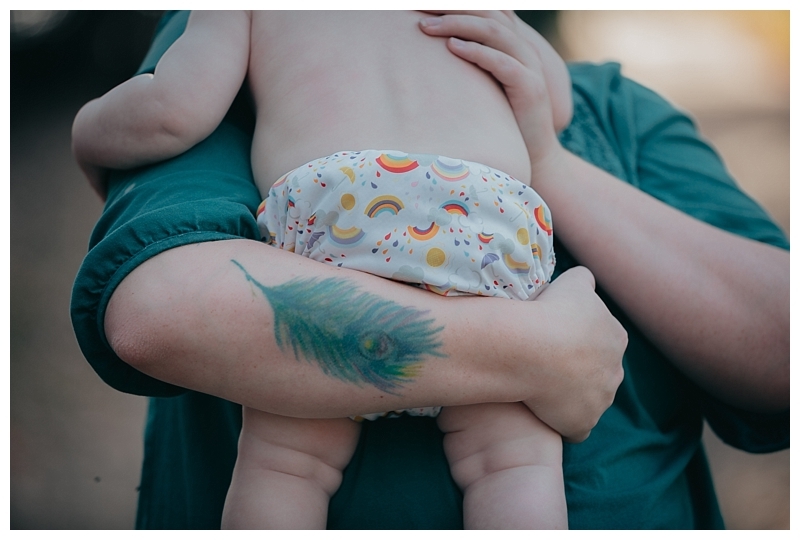 I felt betrayed as I washed the excess ultrasound gel off my stomach in the shower that evening, certainly not the last reminder that I had a tiny little baby inside me that was no longer alive. We had only shared the pregnancy with a small amount of people around us – so I didn’t even feel like I could talk about my grief. I buried my feelings deep down inside me where I learned they consumed me day and night. I was riddled with remorse, despair and immense sadness. and the worst part? I hate that it felt like a secret. Like our own, crappy secret. It’s one thing knowing you’ve lost your little baby. It’s another knowing the pain isn’t over because your body doesn’t realize that the baby has passed away. My body didn’t seem to want to pass the baby. I decided I will not longer hold on to this secret. I will share my story. I will look to the positives of this experience. I will speak about this in hopes that if YOU went through this in secret, that i am here for you. We don’t have to suffer in silence any more!! We don’t have to feel alone or ashamed. We don’t need to feel embarrassed. Together we can talk about the beautiful children we lost way too soon. I am so blessed that even though i felt alone, I wasn’t. I had the most amazing husband, my closest friends (some of who had miscarried themselves) and team of medical staff around me. I had an anesthesiologist that held my hand as they wheeled me into that sterile operating theatre. I hand a nurse was emotional with me as I talked through the pain, I had a Dr who held me as I cried. But mostly, I had an incredible support system in DJ and Quin, who remind me daily how lucky I am to have them. To have my health. And as a way of saying thank you to these incredibly strong and remarkable women, I handmade each of them a gift for participating in this project. 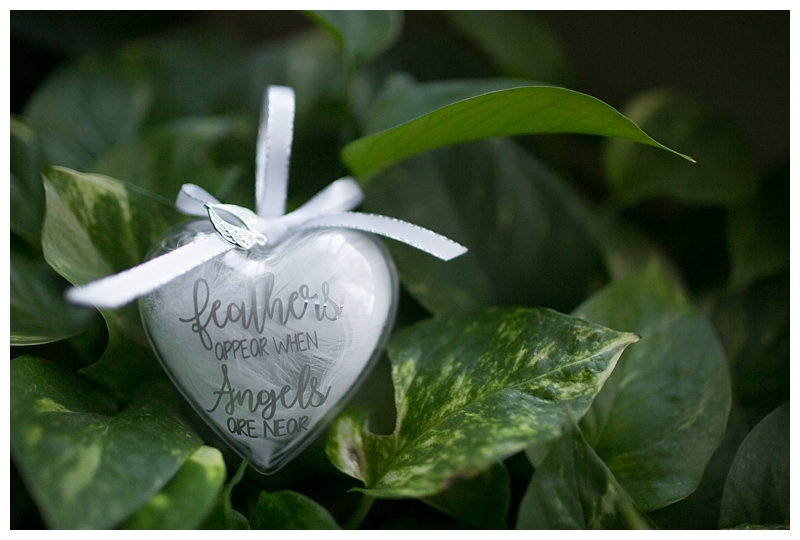 It’s a little ornament that says ‘feathers appear, when angels are near’ I love that the women you’ve just read about have these gifts hanging on their Christmas trees. I look at it every night as I pass my tree and and think of them all. 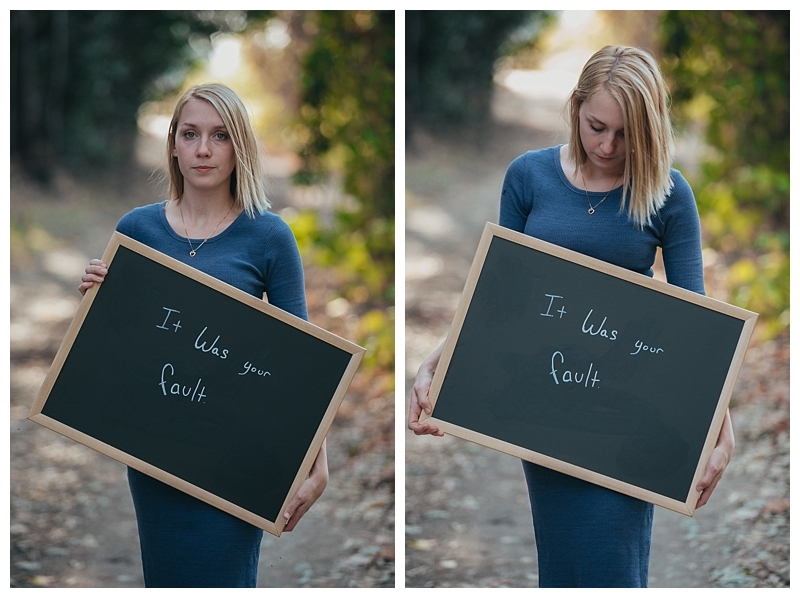 I think of how brave they are to stand in front of my camera and give in to vulnerability. How brave they are to share their pain. I think of how strong they are. I think of how lucky I am to know them. They’ll be part of my story, forever. I am grateful for this project. I am grateful for these families. 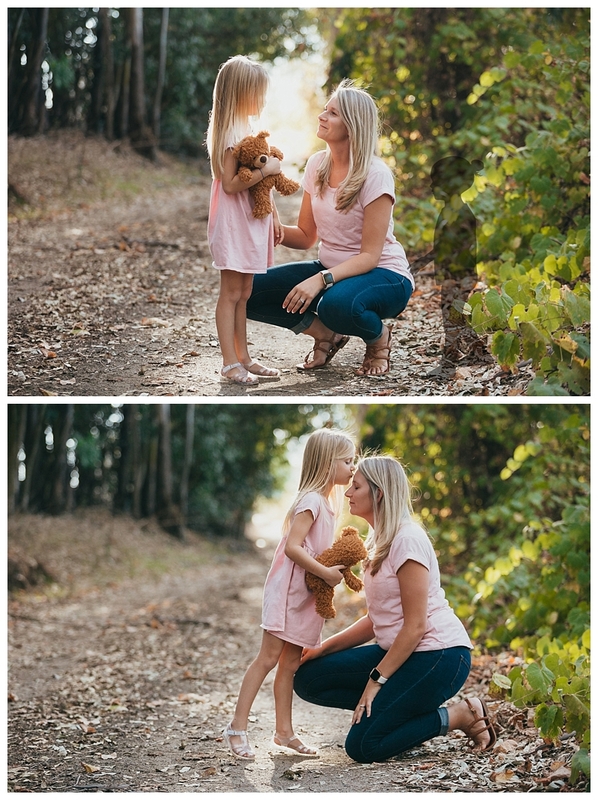 I am grateful that these ladies have become more than just women with stories who once stood in front of my camera. These women have become friends. Beautiful. Everyone of you mothers are beautiful. Thank you for breaking the silence. You are encouraging to tell my story as well. Thank you for your bravery. Thank you for sharing your pictures and stories. All our babies matter. These photo stories are absolutely beautiful. 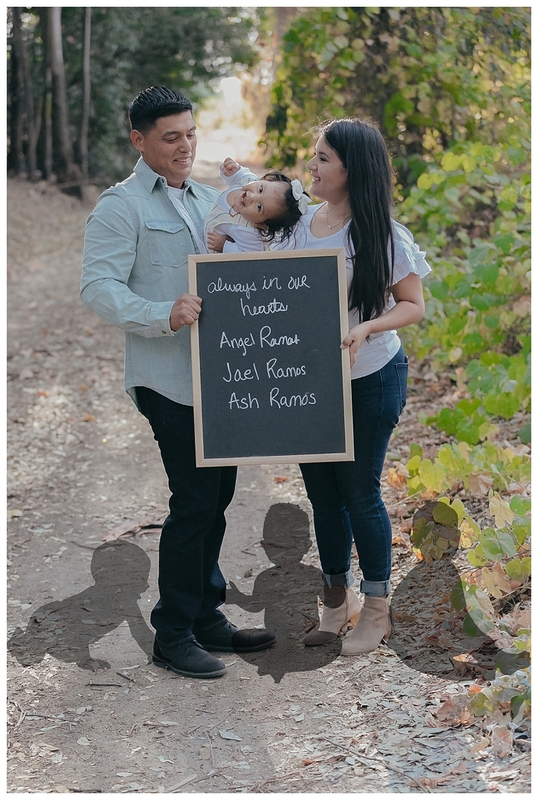 My husband and I have a 4 year old and have lost 6 babies since then. 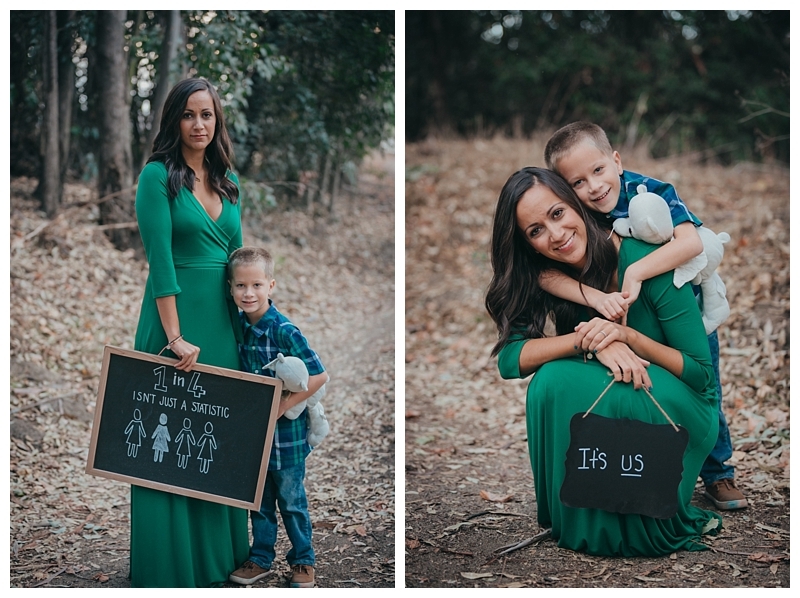 We pray one day our son will get his chance to be a big brother!